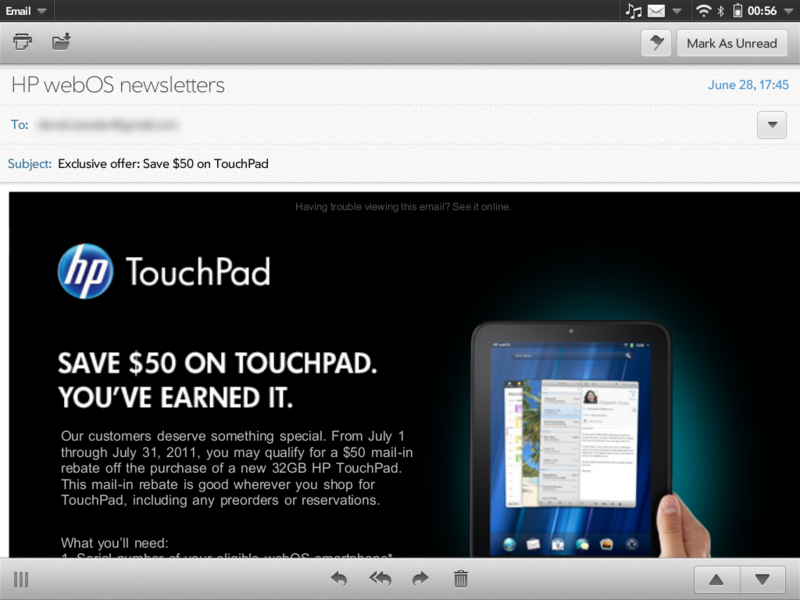 The TouchPad’s packaging is a departure for webOS products. Where the phones were shipped in layered boxes wrapped in a translucent plastic sleeve, the TouchPad comes in a tray-style box where the tablet and included accessories are laid out for you in a well-designed black tray that slips out from inside the white outer shell. As you pull out the tray, the first thing you see is the TouchPad itself, wrapped in plastic adorned with iconography to let you know which buttons are where. The power and volume icons are engrained in our modern visual language, but the cards button icon will be a new and unfamiliar one to those not familiar with webOS. To the left of the dormant tablet is a narrow full-height bin topped with a lightning bolt and USB icons. As you’ve likely already surmised, contained within is a micro-USB cable and AC-to-USB power adapter (you’re so smart). The cable is the same that’s shipped with every webOS phone, and the power adapter is in the same style as the old Palm adapters, but longer to accommodate the charging needs of the TouchPad, and lacking branding. The TouchPad itself is a 9.7-inch tablet that was very clearly modeled after the original iPad. In fact, in a head-to-head contest on external attributes, the two are for all intents and purposes evenly matched. Of course, all that changed when Apple unveiled the iPad 2, which the TouchPad can only match on screen size. In fact, the TouchPad cannot lay claim to being the fastest, thinnest, lightest, or number one anything in the tablet world. Next to the iPad 2 or Samsung Galaxy Tab 10.1, the Touchpad seems downright chubby. The front of the TouchPad is dominated by the 9.7-inch touchscreen. It’s an 18-bit 1024x768 LED-backlit IPS display, faced with a capacitive touch layer under a full-front chemically-hardened Gorilla Glass screen. As one would expect from an IPS display, it has tremendous viewing angles and excellent color reproduction. The screen was perfectly viewable in direct sunlight with the brightness set at around 1/3, and the touch panel was exceedingly responsive. Sitting above the screen in portrait mode is a front-facing, 1.3-megapixel camera for video chat. 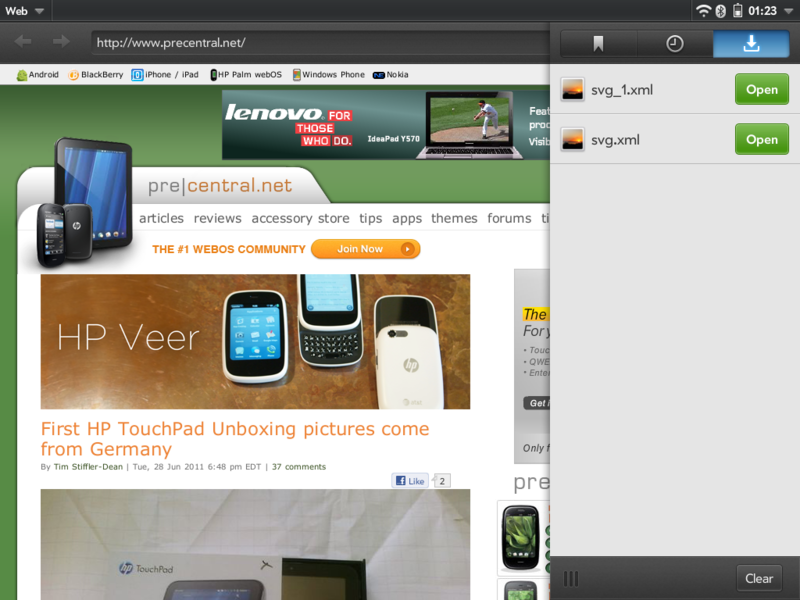 Below the screen is a small physical button where one would find the gesture area on previous webOS devices. The TouchPad has done away with the gesture area concept, but still needed a way for the user to get into card view to multitask effectively. The traditional up swipe is functional on the TouchPad, although it’s not an easily discovered gesture. Physical buttons that are staring you in the face from the moment you pick up the device are easily discovered. The button serves three purposes: it toggles card view, wakes the device from sleep just as the power button does, and contains an LED strip that illuminates with your notifications. This area also contains the communications coils used by the TouchPad to manage pairing and Touch-to-Share with devices like the Pre3. At the top left corner of the tablet you’ll find a headphone/microphone jack. HP’s made a lot of noise over their Beats partnership, and they’ve integrated that tech into the TouchPad. That means dedicated audio processing and an insulated jack to minimize static, which is all meant to deliver a quality audio experience. HP recommends using Beats headphones, though any old pair of headcans will receive the enhanced audio experience. A microphone pinhole sits at center top (right above the camera) and the power button is on the top right. At the top of the right side is the volume rocker, which is mirrored by a cutout at the bottom of the right side that on this Wi-Fi-only TouchPad has no purpose -- it’s the spot where the SIM card tray would reside on the GSM-compatible version of the tablet. Alas, there’s no SIM tray or SIM card here, just a fixed plastic door covering an empty bay where someday there will be SIM card hardware on a future device. The micro-USB port sits at the bottom of the device. It’s the only physical IO port on the entire device, and even then only serves that role in a USB-to-your-computer capacity. There are no USB host capabilities here, so you aren’t going to be hooking up card readers, video output devices, keyboards, or whatever other tethered hardware suits your fancy. It’s possible HP could add this in a future version of webOS, but here out of the gate the TouchPad is lacking those features. The left side of the tablet holds a pair of stereo speakers (they will be at the top or bottom in landscape orientation). These speakers are surprisingly robust, with decent sound and volume. It’s clear HP put a lot of thought and work into making sure the speakers could produce good sound. You’re not going to be able to use a TouchPad alone as a party stereo system, but it should be more than enough for casual music listening or movie watching. When using the TouchPad case, the speakers are on the hinge side of the flap, which puts them facing away from you in typing orientation and pointing down (but towards you ... kinda) in vertical movie orientation. As revealed at (and often lamented since) Think Beyond, the TouchPad’s back case is curved glossy black plastic. It’s an instant fingerprint magnet, more so than even the glass screen. We would have much preferred a soft touch, or even just matte finish, back, but HP stuck with the glossy black. To make matters worse, this glossy back is also slick. While we managed to never drop our TouchPad, we can’t say we were ever really comfortable holding it one-handed from the side in landscape orientation. Portrait was doable, so long as we held it with fingers under the center of gravity (which itself is dead center). All said, the TouchPad seems to be nicely put together. There was no noticeable flex in the body, no large gaps (even around the non-SIM door), no strange imbalances. It has a gorgeous screen and great speakers, but a certain amount of heft that the competition does not. The TouchPad is 0.54 inches thick, while both the iPad 2 and Galaxy Tab 10.1 are 0.34 inches. The TouchPad weighs in at 1.63 pounds, compared to 1.33 pounds for the iPad 2 and 1.25 for the Tab. Needless to say, the TouchPad isn’t skinny. HP’s done a decent job of shaping the TouchPad so that the thickness isn’t so obvious. In fact, the shape is a lot like a rounded-off first-generation iPad. Much of the TouchPad’s design was very clearly inspired by and targeted at the original iPad, though it’s surprising that HP didn’t make any strides to surpass that category-defining product in the dimensions metric. Where HP did manage to surpass the iPad, and even the iPad 2, is in the area of internals. The TouchPad packs an extra snappy dual-core 1.2Ghz Qualcomm APQ8060 processor, backed up by an Adreno 220 graphics chip and a full gigabyte of RAM. You have the option of 16GB or 32GB at launch, though you’ll be limited to just the Wi-Fi version. An AT&T-compatible cellular TouchPad is due later in the year. The TouchPad also packs Bluetooth 2.1 as well as an accelerometer, gyroscope, compass, and ambient light sensor (somewhat annoyingly placed in the top right corner, directly underneath where your hands hover when typing in landscape with the speakers pointed up). All of that combines for snappy performance that is nearly 99 percent of the time on par with the latest from Apple and Samsung. That 1% of the time? The TouchPad inexplicably stops for a few seconds. We were told by HP that the user interface (and the rest of webOS 3.0) still isn’t fully GPU-accelerated, which could account for some of the slowdowns, but our suspicion is that there are still some optimizations to be made. Actually, we hope that’s the case, because these multi-second (occasionally up to 10 seconds) can be especially frustrating. The OS does pay attention to what’s going on during those freezes, so once it finally catches up all your taps and swipes during that time are applied in quick succession. If you’re familiar with webOS, then webOS 3.0 on the TouchPad will be instantly familiar. It is the webOS we’ve come to know and love, just updated for the bigger screen. 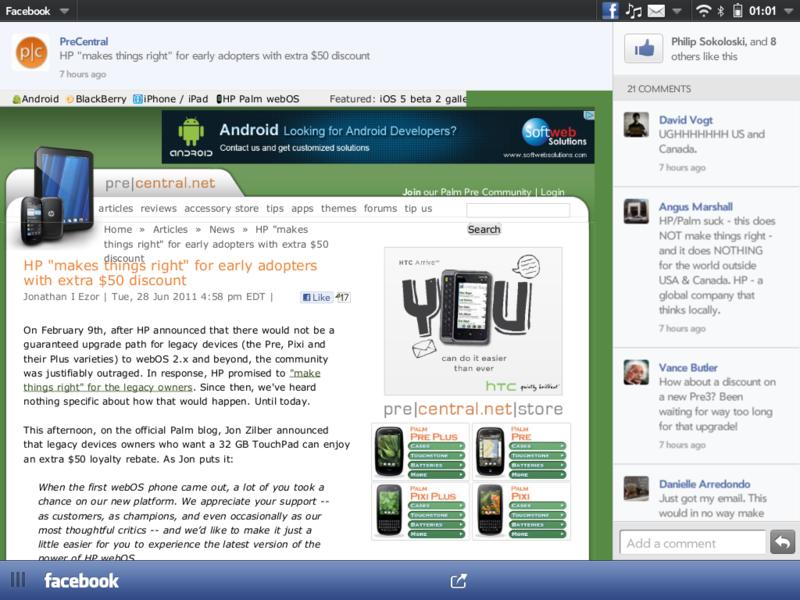 3.0 has several user interface enhancements over 2.1, but it’s still the webOS we’ve come to know and love. 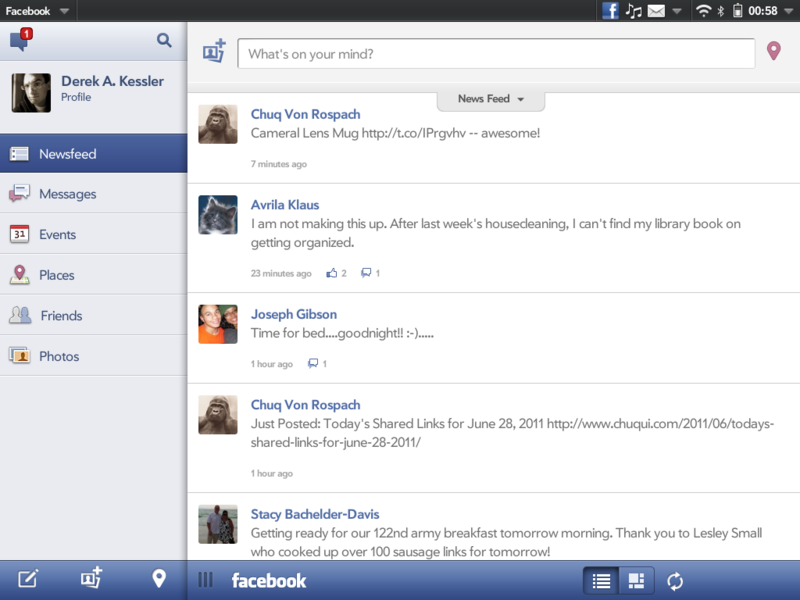 The entire UI rotates in every direction now, with the menu bar moving to the new top in each orientation. 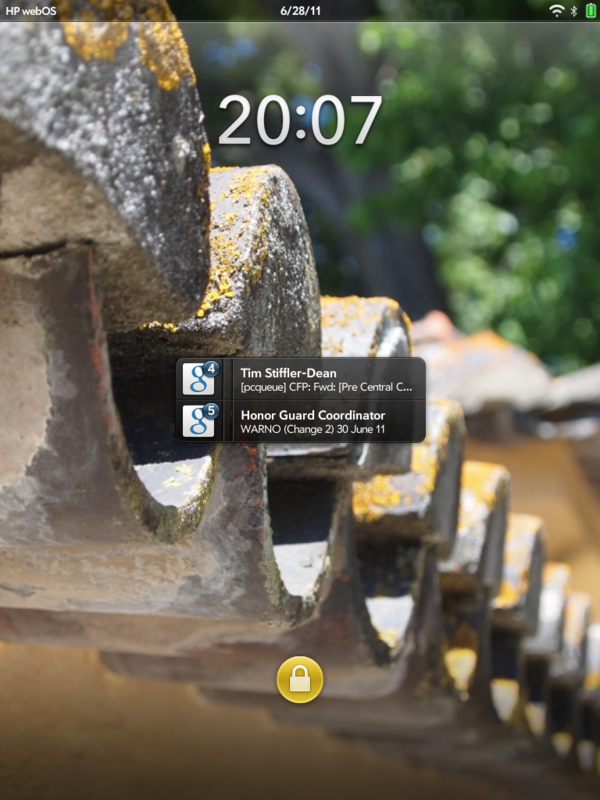 The notification area has moved from the popping up across the bottom to a spot in the top right of the menu bar, just to the left of the device menu. The device menu behaves exactly like the device menu from previous versions of webOS, though it has incorporated at least on homebrew element in the form of a brightness slider. There are also options for rotation lock and mute, making up for the lack of a ringer switch on the side. 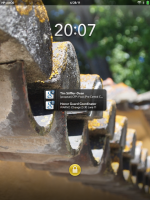 The notifications work in a manner that combines the best of webOS and Android. They’re now placed in the aforementioned drop-down menu at the top right, no longer taking up a slice of the screen when you have a notification. That system worked fine on older webOS phones, but doesn’t make much sense on a tablet. Thankfully, HP’s managed to maintain Palm’s lead with notifications, crafting a system that is instantly intuitive, functional, and efficient. Banner notifications (like Messaging and Facebook) get the same banner treatment that collapses into an icon as they did before, while others like Email are still just an icon and a sound. Dashboard controls, like in Music, get an icon when that app is not in focus. In essence, the actual notifying part of webOS 3.0 has not changed one bit. Tapping on the expanding row of icons produces a drop-down menu with rows for each app’s notifications. If you’ve received multiple notifications for a single app, they will create a virtual stack that you can swipe through to triage down to the important notifications. This is especially useful for Email, at least for us since we can get upwards of a hundred emails a day. Swiping through the stacked notifications dismisses the notifications, but doesn’t mark the message as read. You can dismiss an entire stack of notifications by grabbing the icon and tossing it off to the side. 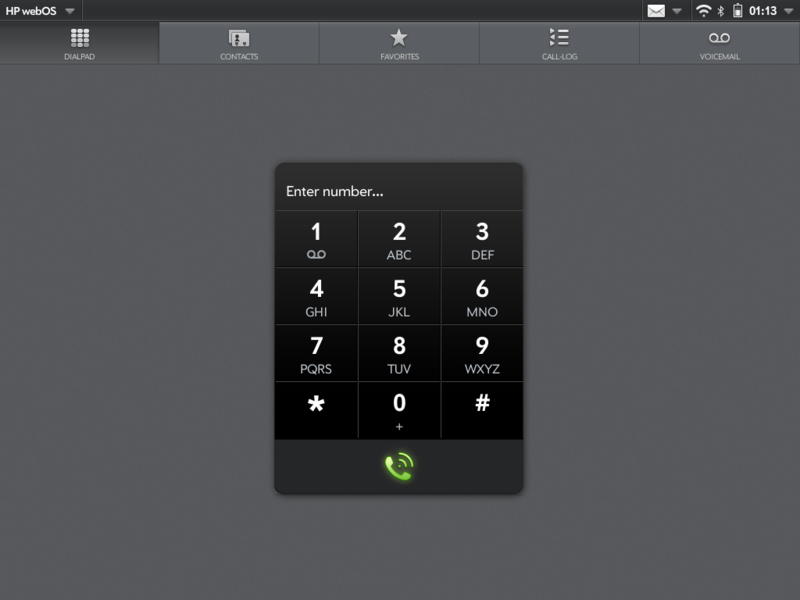 The same card metaphor that defined webOS is present in version 3.0. You can both press the physical home button or swipe up from the bottom edge of the screen in any orientation. The swiping doesn’t work like the old gesture area swipe, so you can’t do a slow drag up to lift up the old Quick Launch wave, mostly because there’s not gesture area. Swiping up from the bezel will first throw your running app up into card view, a second swipe will open the launcher. Swiping up again will close the launcher (still somewhat unintuitive), successive swipes will open and close the launcher. It works exactly the same way as the up swipe has since webOS 1.4.5. The home button’s functionality has changed from the Pre of old, where it simply toggled card view. On the TouchPad, however, this single front-facing button duplicates exactly the function of the up swipe: card view, launcher up, and launcher down. Annoyingly, the launcher up and down, whether by swipe, physical button, or virtual button in the Quick Launch bar, is always accompanied by a sliding paper sound that cannot be disabled. Stacks are present in 3.0, allowing you to group together common apps. Stacking happens automatically for the most part, but often we had links in emails launch into an unstacked browser card. In practice, Stacks work better and make more sense on the TouchPad than it did on phones like the Pre 2 and Veer. You can still swipe left and right in card view to switch apps (there’s no “advanced gesture” to switch without leaving full view), and tossing cards off the top works to close. You can also pull apps to the bottom to slingshot them off the top, and if you rotate the TouchPad such that the micro-USB port is on the left side, that pull down yields the stretching slingshot and flung birds sound effects from Angry Birds. It’s hysterical, and led to us wasting at least five minutes opening a bunch of apps and firing them off the screen. 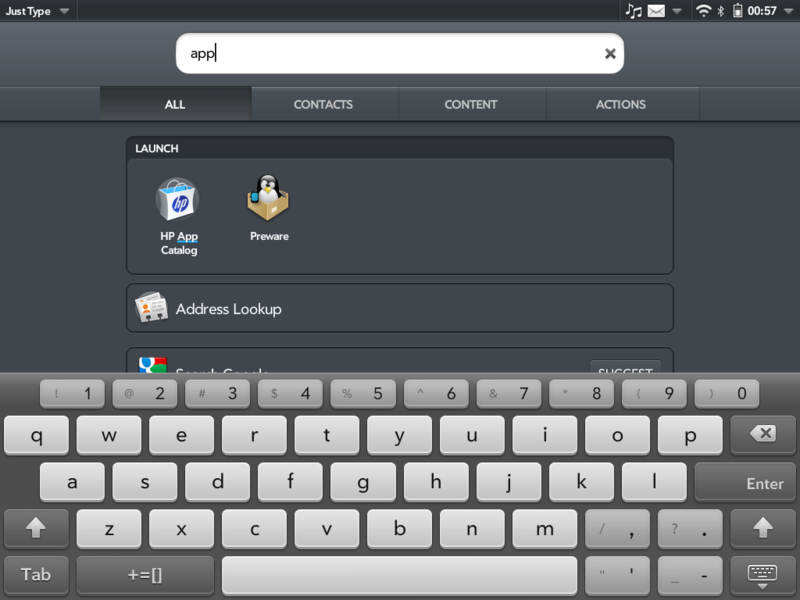 New in webOS 3.0 is a virtual keyboard. 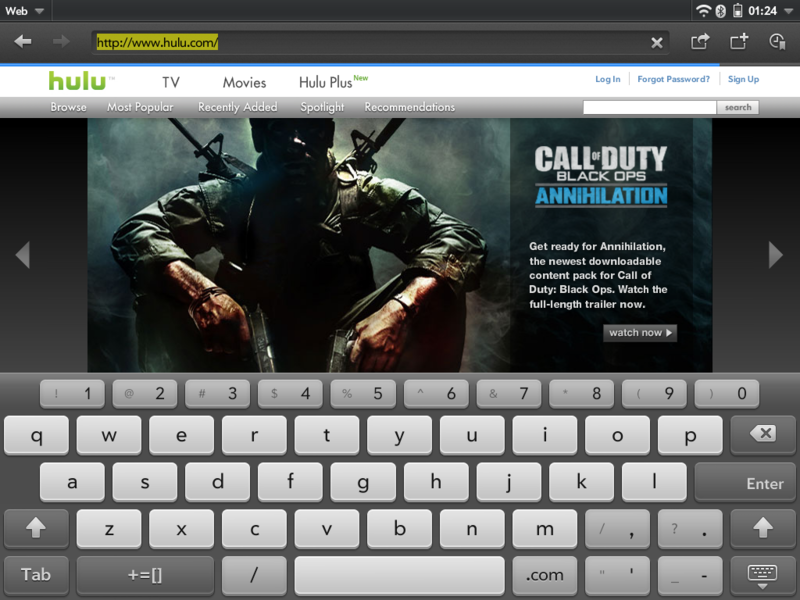 For the first official attempt at a virtual keyboard in webOS, it’s surprisingly useful. We’d actually go so far as to say it’s equal to that of the iPad, if not better. The top number row is a revelation in the world of virtual keyboards. 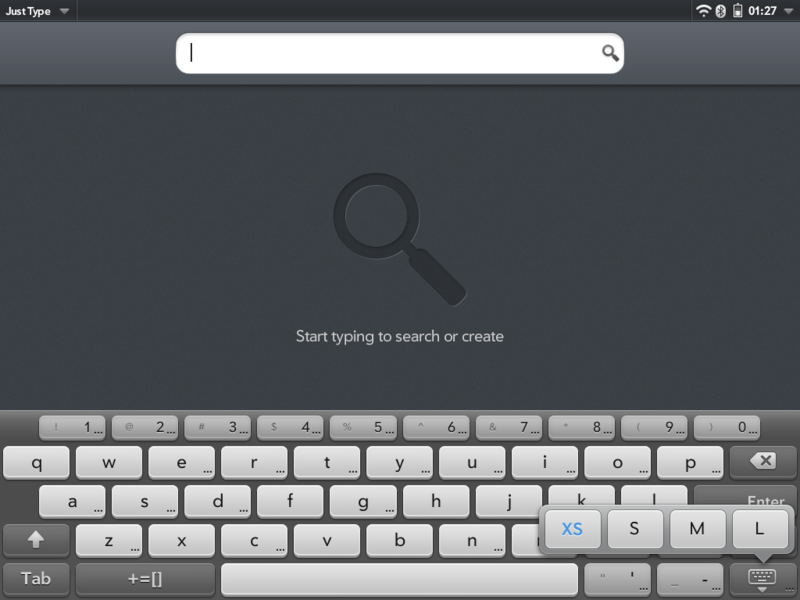 It’s seriously a massive time saver, especially the shift characters - they match exactly your standard QWERTY keyboard. The keyboard is usually lower case letters, but when at the start of a new line/sentence or when holding or having tapped shift, the letters switch to upper case. 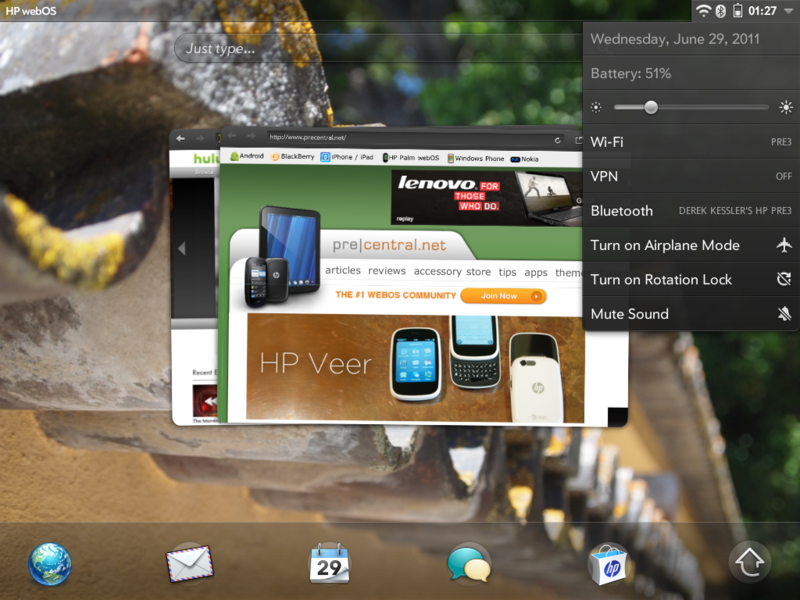 It can be a little jarring at first, but it, like many other features in webOS, is surprisingly intuitive. 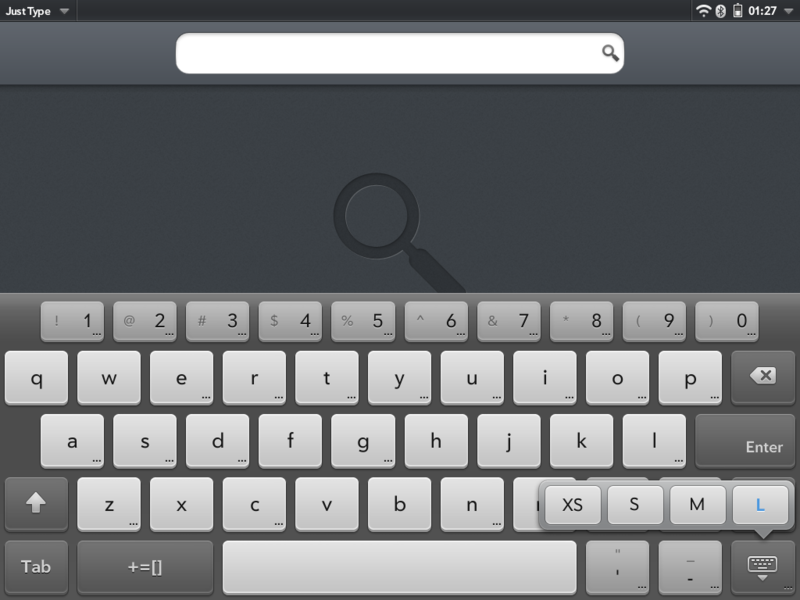 The bottom right key is used both to dismiss and resize the keyboard. Options range from extra small to large. XS takes up just you under a third of the screen in landscape, and one quarter in portrait, while L fills half in landscape and a bit less than that in portrait. In out testing we generally full back to the middle sizes of S and M. XS was just too small to type with speed and accuracy, while L was too far spaced for our hands. Of course, your mileage - and hands - may vary. Regardless of size, we had a tendency to hit the n and m keys when aiming for the space bar, and webOS’ text correction still so far behind that it couldn’t parse out wordnword. On the subject of autocorrect, the dictionary seems to have problems with apostrophes: it has all of the contractions in place, but doesn’t correct to their apostrophized form (e.g. isnt is not recognized as misspelled and thus does not autocorrect to isn't). On the plus side, autocorrect does now learn, so if you undo its correction and select your own, it will remember and use that correction the next time you make that same mistake. Text prediction is nowhere to be seen. Text selection is greatly improved. 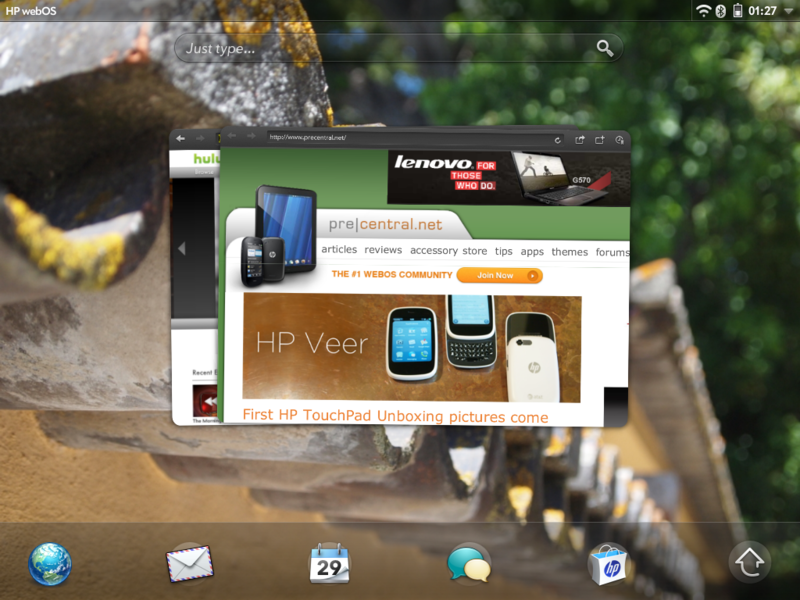 In fact, it’s stupendous compared to previous versions of webOS. There’s no more holding down keyboard keys and tapping on the screen. All you have to do is double-tap on any work and it will highlight, and a third tap will add drag handles at either end (a small downward-pointing triangle to mark the start, and one pointing up at the end. Along with the drag handles you’ll get a pop-up box with cut, copy, and paste options. Pressing and holding in any text field will open a pop-up with select (which will highlight that word and give you the aforementioned drag handles), select all, and paste. It’s fairly intuitive and works well. What doesn’t work well at all is text cursor placement. 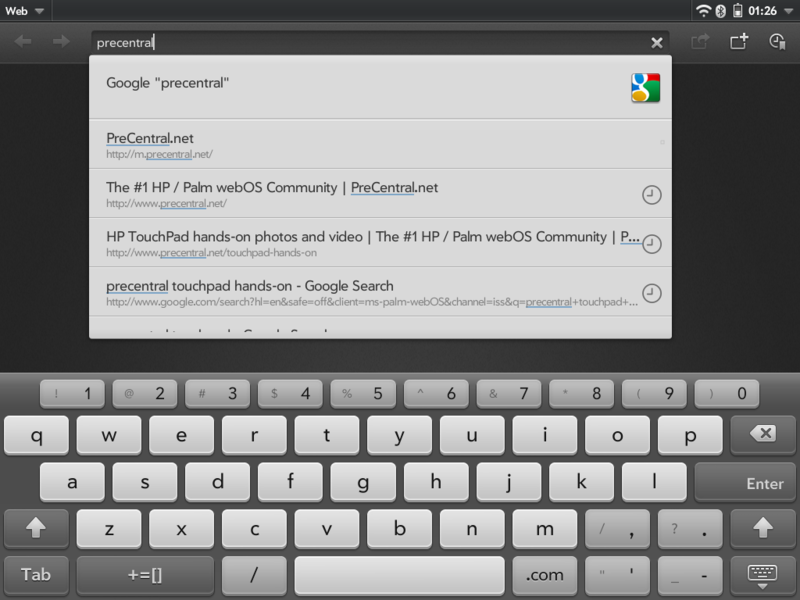 Since webOS 1.0 you could tap to place your cursor bar, and then hold the Opt key and drag on the screen to get more precision. webOS 3.0 has not improved on this. If anything, it’s taken a massive step back: as best as we could figure, there’s no method for precise cursor placement in webOS 3.0 - you have to tap and re-tap until you get it where you want. It’s not good, and when you’re trying to make numerous edits in a large piece (like, say, this review), then you’re going to get frustrated very quickly. 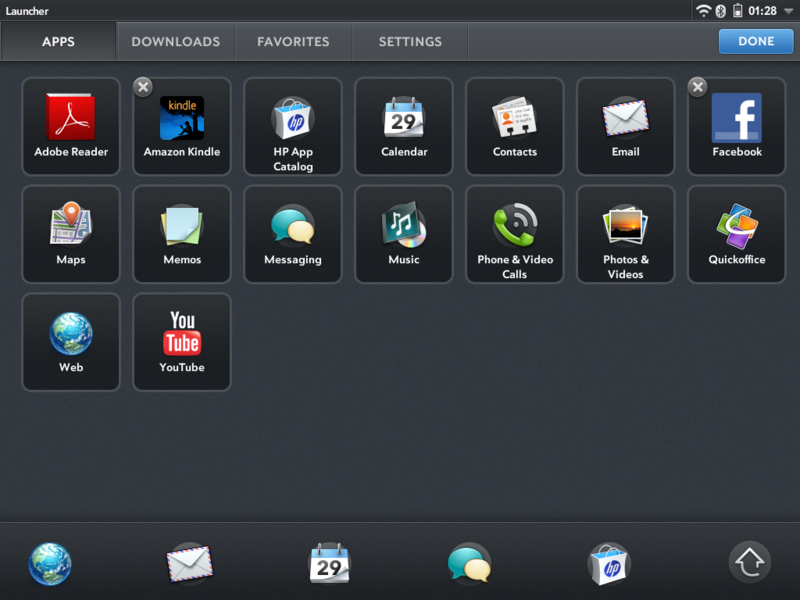 Overall, the webOS experience has not changed with 3.0, and that’s a good thing. 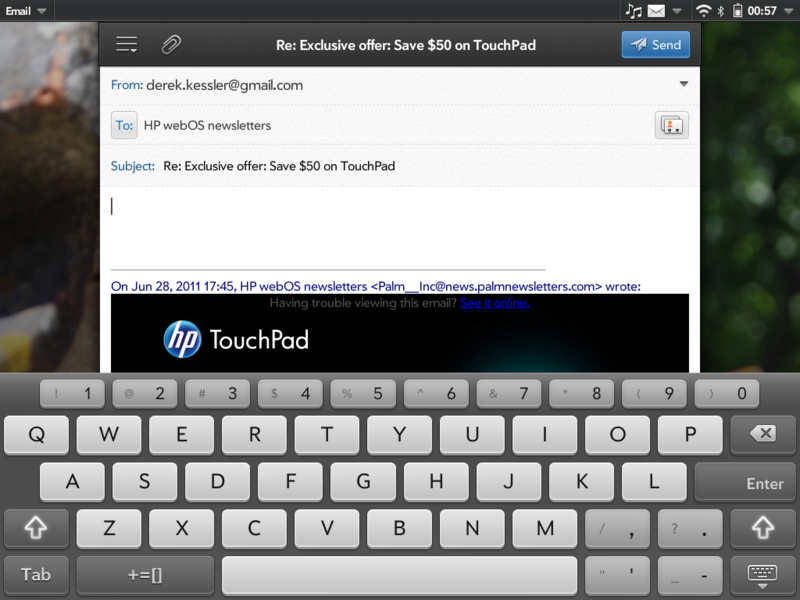 On the TouchPad, webOS remains at the top end of the intuitive mobile OS spectrum, and the changes that have been made should scale nicely to the smaller smartphone screens. 3.0 improves on the solid foundation of previous versions, but like those previous versions, it won’t matter if HP can’t sell the public on the merits of webOS. The webOS 3.0 launcher is an exercise in plainness. It now fully rotates and you can place five apps in the quick launch bar across the bottom of the screen. These icons stay in place when you bring up the full launcher, where they’re duplicated in the order of your choosing - it crosses the best of webOS 1.0 (permanent dock with unduplicated icons) and webOS 2.0 (card view-only dock and duplicated icons). The opened launcher has lost the translucency of its predecessors, instead opting for a slightly noisy opaque gray-green background. The app grid changes in landscape and portrait - 7x4 and 5x6, respectively. As with previous iterations of webOS you have no choice of icon size or spacing, though HP seems to have picked well in this case (and, of course, the scroll vertically so you can fit more than 28 or 30 apps on a single page). 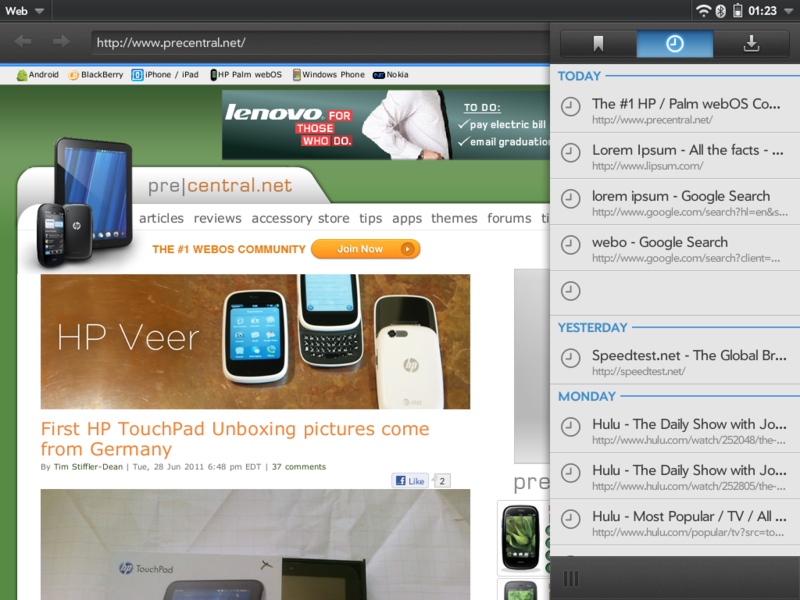 Because they have much more space available on the larger screen, HP added tabs to the launcher. 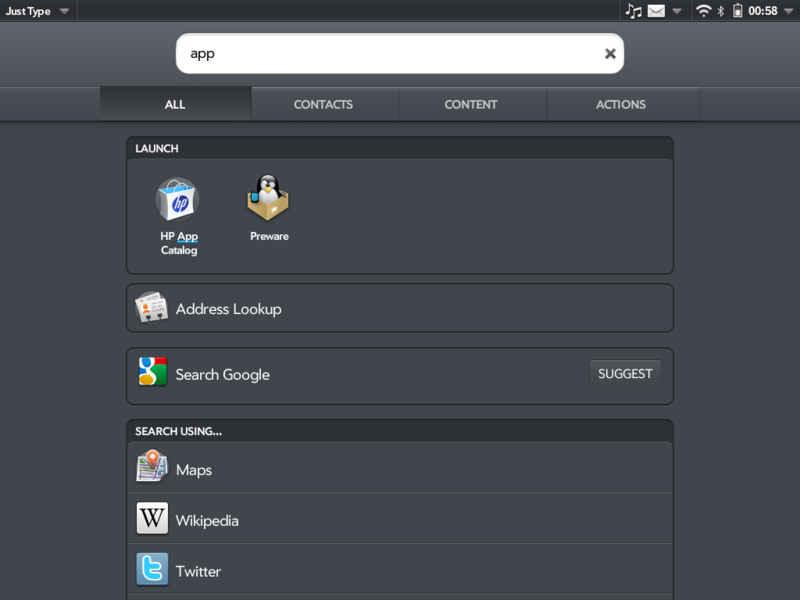 The launcher’s pages can be accessed by tapping on the tabs (located along the top, naturally) or swiping left or right. 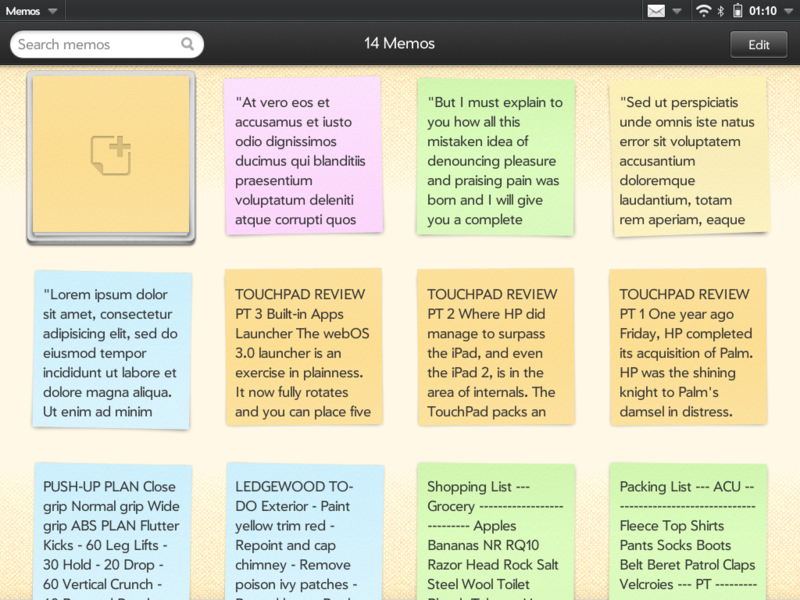 Out-of-the-box you’ll find four oddly-named tabs: Apps, Downloads, Favorites, and Settings. Apps holds all of the first-party apps (Contacts, Calendar, Memos, etc), Downloads has the App Catalog and any apps you download, Favorites is empty, and Settings contains the spread of individual preferences apps (the consolidated app we saw way back in the emulator leak didn’t make it to the final version). Those four tabs are all you get. You can’t move the tabs, you can’t rename them, and you can’t add or delete more tabs. It’s an enormously frustrating organizational system if you want to go by the tab titles. “Apps” should mean all apps, but it’s only the built-in apps, while downloads is only the apps you’ve downloaded, not any files. On my phone I preferred to have my most-used apps on the first page, with games, miscellaneous apps, and preferences on the other pages. Conceivably I could do the same here, but then the tab naming wouldn’t make any sense. Moving apps around has at least improved. Tap-and-hold on an app icon puts a highlight box around all of the apps, with a delete x in the top left corner. You can then drag around and reorder your apps to your heart’s content, once you’re done just tap the Done button or off one of the apps to exit reordering mode. The launcher is smooth and minimalist attractive, but the handicapped tab functionality is a major letdown. Hopefully there’s a webOS update coming down the pike to restore the functionality that was present in webOS 2.0 (and hidden in webOS 1.x), until then I’ll just have to deal with organizing my apps under tabs that make no sense, as well as getting used to new apps appearing on my games page. Where the launcher is a disappointment, the Calendar app is at least a small improvement in some ways. It had to be, really. Much of the functionality of the old calendar app is present here, but it’s presented in a layout that suits the larger TouchPad screen. The app has been redesigned to subtly emulate one of those large desktop calendars (a nod to the corporate customer, we suppose). 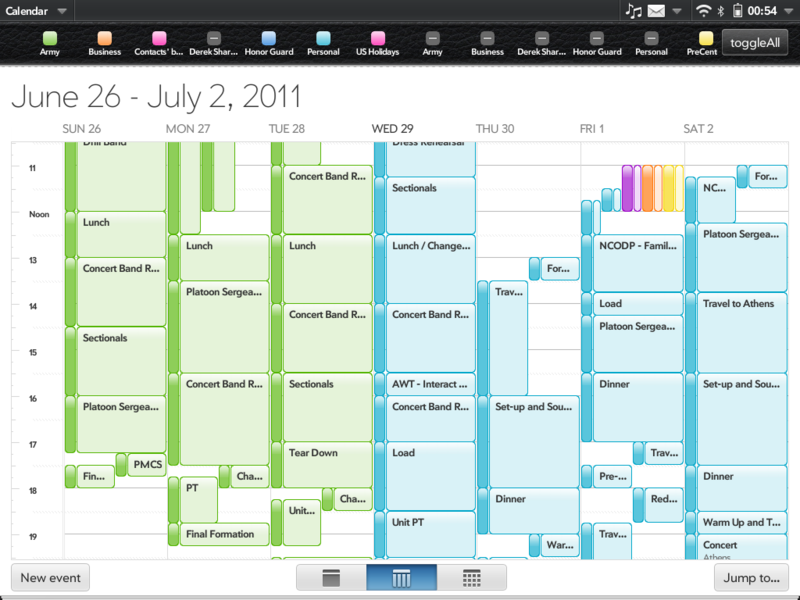 Your color-coded calendars are listed across the top, each tappable to toggle them on and off in the main view. The bottom view always holds a New Event button, day/week/month selector, and Jump to ... button. 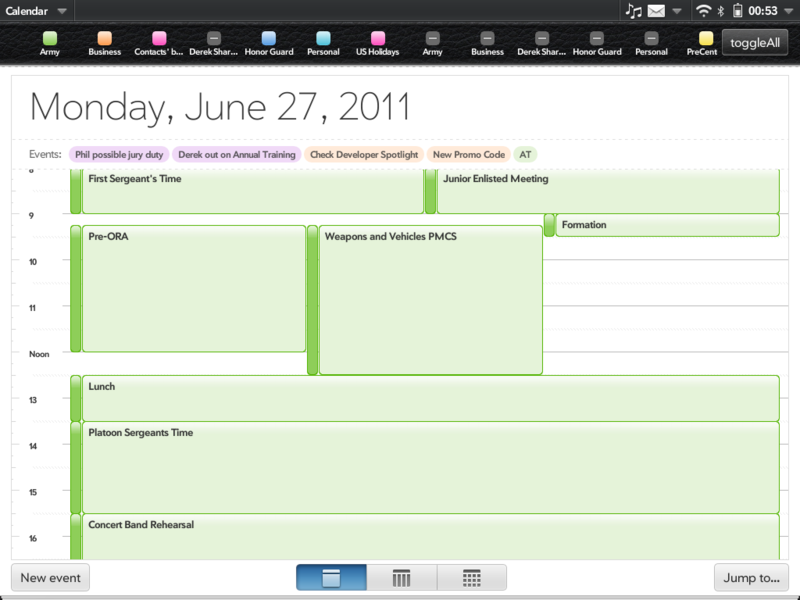 Day view essentially takes the old webOS 1.x calendar day view and scales it up to the bigger screen. The only difference is the large date at the top (“Sunday, June 26, 2011”, for example) and the occasional weirdly overlapping appointment (not sure if that’s a bug or design feature, but it’s weird). Week and month views also scale up the older versions, but at least allow for details like event titles to be shown. Tapping on an existing event opens an Event Details pop-over with the relevant details (time, location with mapping button, reminder, and notes) and buttons to delete, edit, and close the dialog. 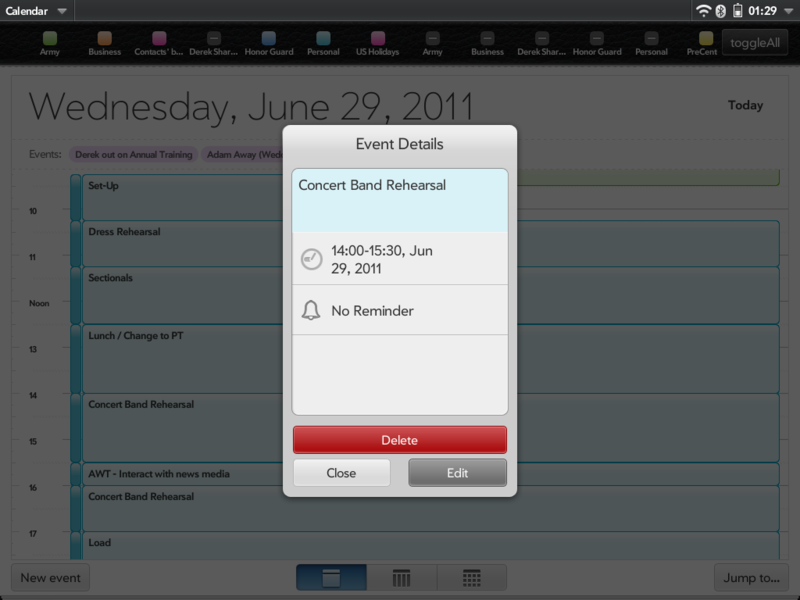 New events are created in a larger version of the old webOS calendar dialog, with all its niceties and annoyances. Chief among those annoyances is the date selector, which still stacks as a vertical scrolling list of numbers instead of the much more logical month grid so you can tell if July 18 is a Wednesday or a Sunday. It gets even more annoying with the time, which has jumped from five-minute intervals in previous webOS calendar apps to single minutes. The scrolling number picker will never fill the entire vertical space of the screen, instead it expands to the furthest end, which even in landscape mode isn’t quite enough to get to 15 from 0. At least with the older phones you could type in a number and select that time – that’s no longer an option. Likely due to this single-minute fidelity, you can no longer tap and hold on calendar events to move them to a different time, though having it snap to the next hour would be more acceptable than not being allowed to move them at all. What once was a simple three-step action (tap and hold, drag, release), has instead become at minimum a five-step process (tap, edit, tap time, select time, done) that isn’t nearly as intuitive. The calendar also suffered from speed issues, lagging when switching days or weeks just long enough that it was noticeable, often up to three or four seconds. Additionally, the calendar would sometimes get stuck trying to render one day while still displaying the old one, with the two layered over each other in a confusing jumble that took a few seconds to clear. We also ran into a issue with the calendar where it stopped syncing to Google Calendar after entering a several day’s worth of schedule on the TouchPad. We tried moving those dozens of appointments to our Palm Profile calendar and to a separate Google account, with the hopes of at least saving them while we removed and re-added the failing Google account, when we discovered that Calendar was no longer syncing new appointments to any of our accounts. Not good at all. There are some very rough edges in Calendar that need to be cleaned up quickly if this tablet’s going to be a viable contender in the business space. 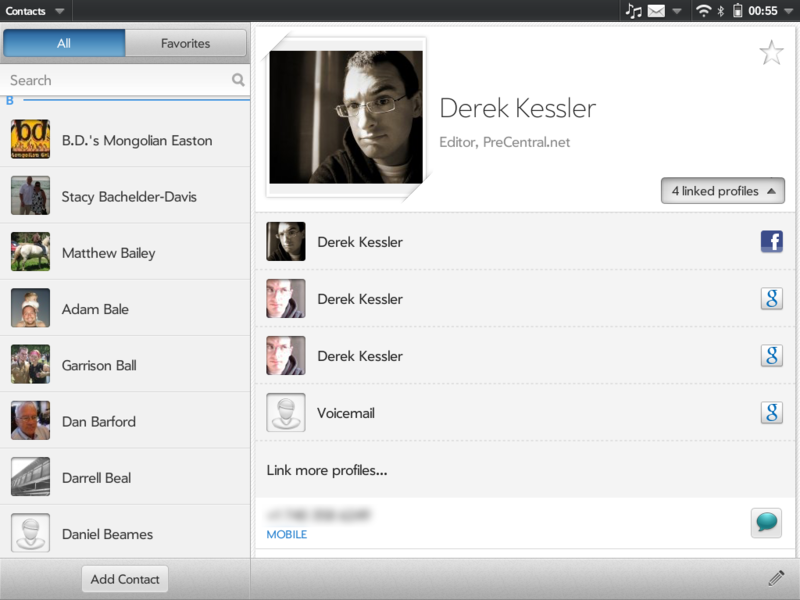 Contacts is one of those apps that received an Enyo rewrite, but hasn’t received much in the way of a functionality boost. It’s still a solid contact management app, now spread out into a two-column view: an alphabetical list of your contacts on the left, and the contact you’re viewing on the right. Everything is merely bigger here, though the photos now display in a pleasing larger size with photo album-style corner borders and tucked corners. 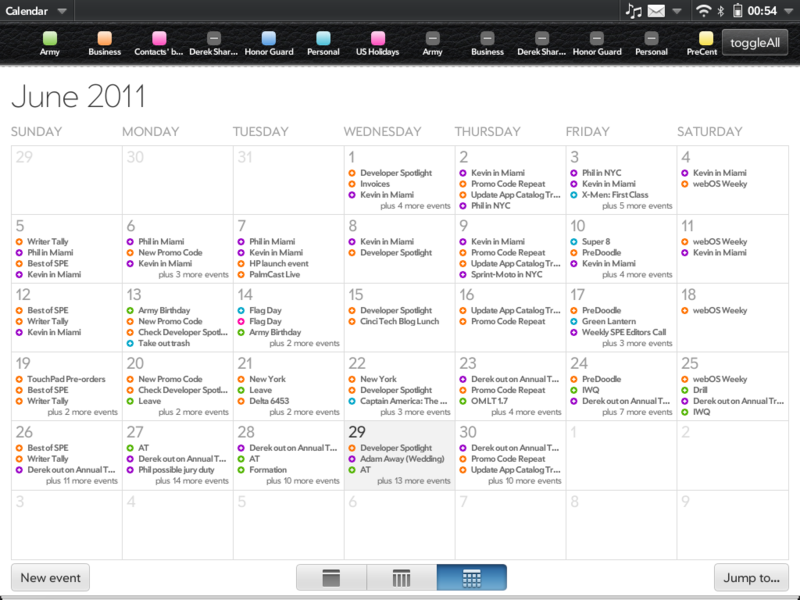 It’s cute, unnecessary, but like the desktop calendar pad style of the Calendar app, not distracting. You can still view and manage your contacts’ linked profiles in a drawer that slides down the entire contact, open mailing addresses into maps, email addresses into email, and all the rest behaves exactly as it should. No functionality appears to have been lost in the transition to Enyo and webOS 3.0. 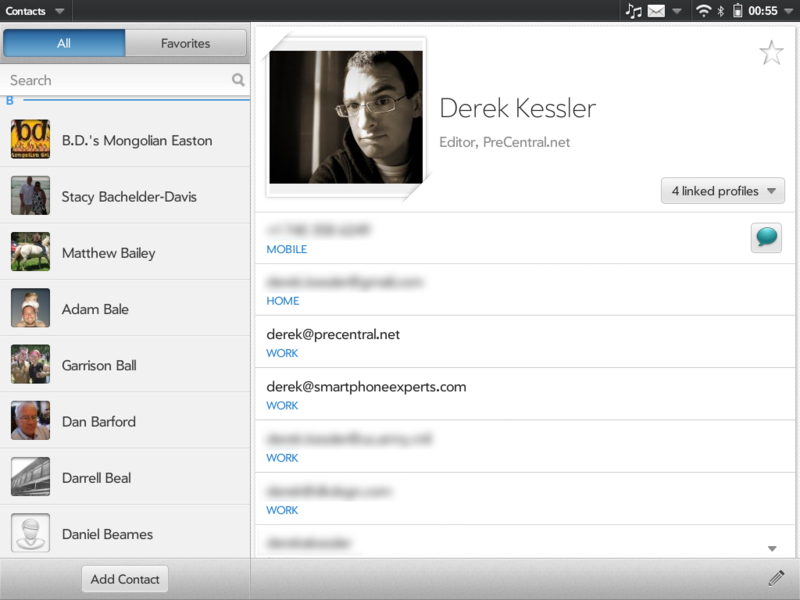 That said, despite the magic of Synergy, the webOS Contacts app has always been a bit Spartan for extra features. What more could a Contacts app need? There’s a lot, and we’re shocked that HP still hasn’t fulfilled the potential of Synergy by hooking Contacts into the other facets of the services with which it syncs. Where’s the latest Facebook and Twitter status? Where’s the list of that contact’s latest emails and messages? There’s so much unexploited potential with Synergy that HP’s not taken advantage of that competitors have managed to integrate in far less elegant fashions into their systems. The first app to receive a real functionality update is actually the first Enyo app we ever got to see: Email. 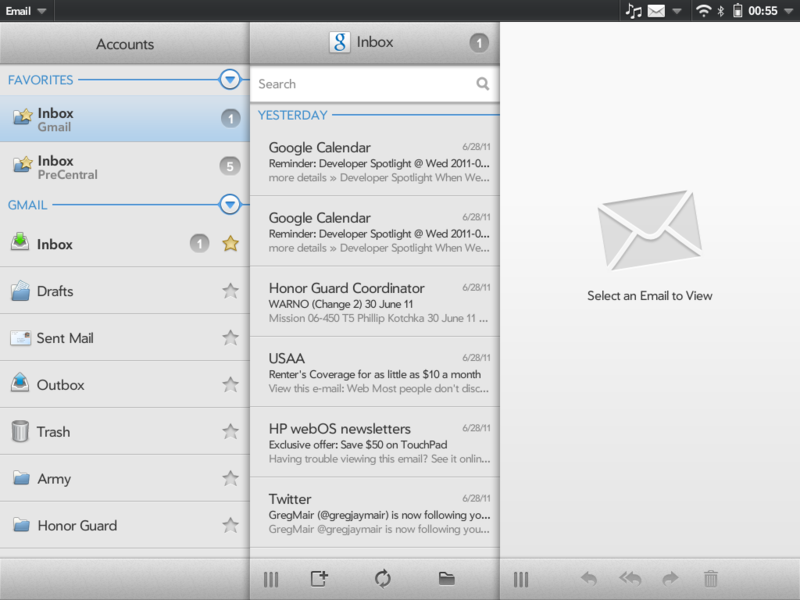 Previewed way back in November 2010, Enyo’s adaptable user interface is best demonstrated by the email app. 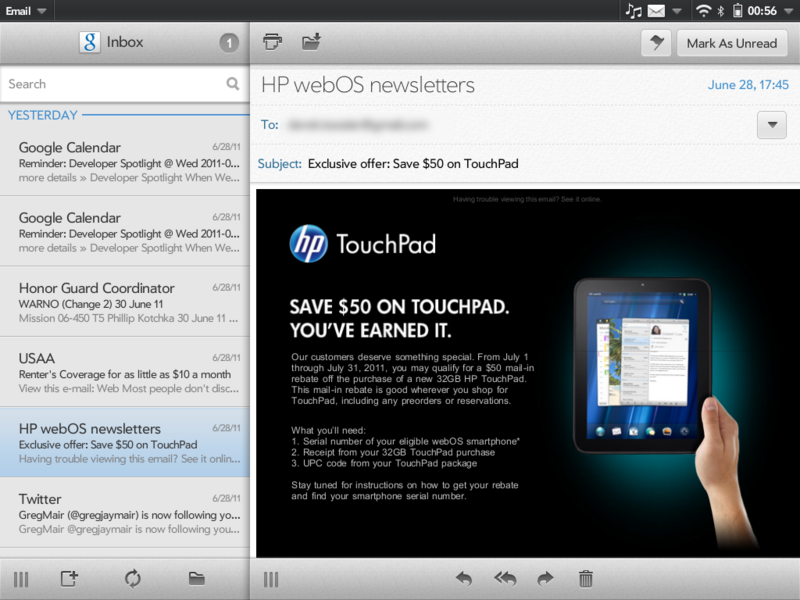 Email is now presented in a sliding three-pane layout, reminiscent of some desktop apps. The far left column is a list of your inboxes and folders, topped by your favorites. The middle column is the list of messages in the selected folder, topped by a search box. 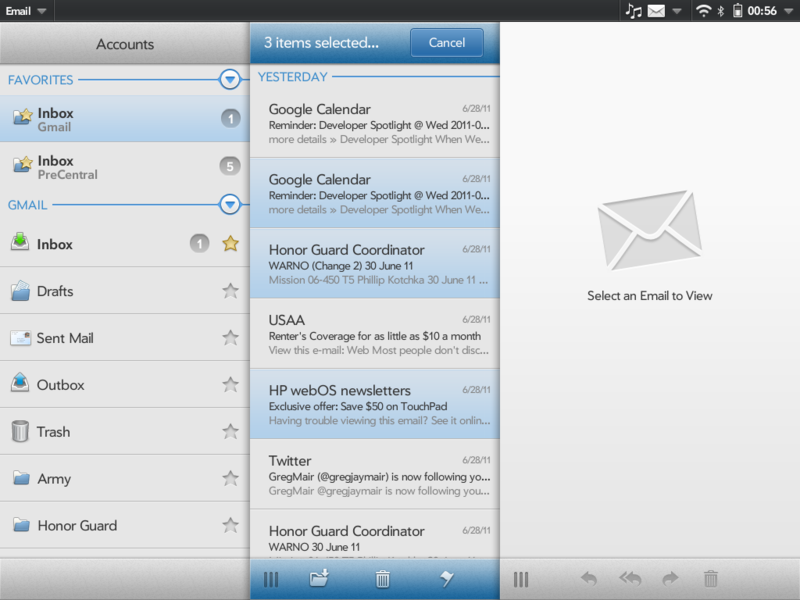 The bottom holds three buttons: new email, refresh, and a folder to signify multi-select. Tapping the folder switches the entire column into a blue-hued multi-select mode where you can simply tap on messages to highlight them and then move them to a folder, send to the trash, or add or remove flags. Once you pick the action, it’s applied and you’re dropped back down to regular list mode. The far right column is where the actual e-mail resides. It’s treated in one of two ways: if it’s straight text, the text size doesn’t change and it reflows depending on your width (more on that in a moment), while HTML-formatted emails scale with the column width. The top bar across the message view has gained a buttons to print (with an HP networked printer, which we sadly did not have access to during our testing), move just this email to a different folder, toggle flagged status, and toggle read/unread status. They’re all incredibly handy and fit very well into our workflow. Reply, Reply all, Forward, and Trash sit at the bottom. What makes the Email app the epitome of Enyo-tasticness is the columns themselves. The list and message columns have little grab handles at the bottom that you can tap or drag to the left and right to collapse or expand columns and give your message more or less room on the screen. The columns in email all collapse to the left, stacking with the folders on bottom, followed by list, and then messages. This system makes for a fantastic email triaging system (especially when coupled with the previously-discussed stacking notifications), as well as for great email reading. The compose window is fairly Spartan: it’s a fixed-width affair (the background peaks in on the sides when in landscape) that takes after the previous versions of webOS. It’s basic: you’re not going to be inserting images inline with your text (or anywhere in your text, for that matter), hyperlinking individual words, or partaking in any other form of modern day email magic. 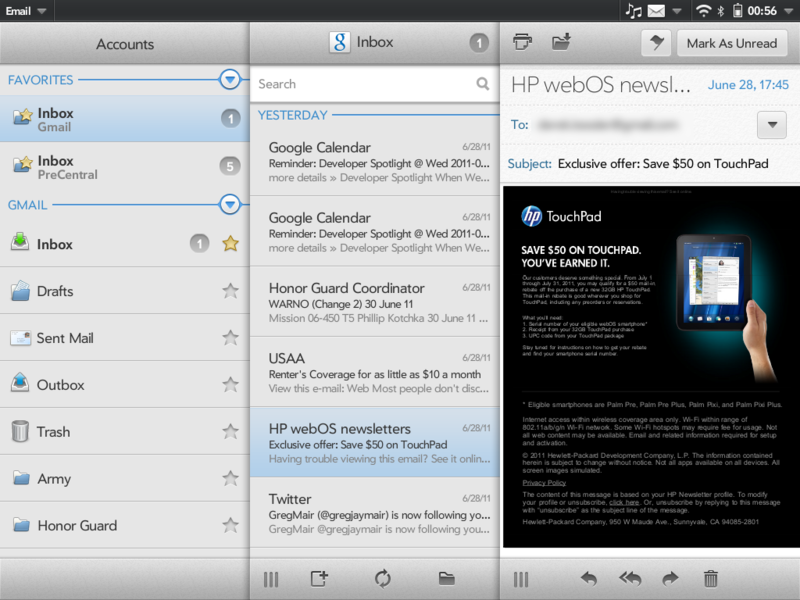 Heck, the webOS 3.0 email client has even lost the ability to format text as bold, italic, underlined, or colored, something that webOS fans have been doing for over a year now. Even with all the magic that sliding Enyo panels bring, the Email app is still lacking in many ways. There’s no threaded messaging, which is now supported on every competing platform. There’s also still no proper Gmail labels support, which we know is only important to a set of potential TouchPad buyers, but so does LinkedIn, Box.net, and Snapfish integration (to say nothing of MobileMe, which is hilariously available in Synergy despite its imminent demise and replacement with an iOS-centric cloud solution). Enyo has brought a massive user interface improvement to Email and webOS 3.0 in general, but the features aren’t there yet. Don’t get us wrong: the UI enhancements are fantastic, but a great experience only goes so far when that experience only lets you do so much. 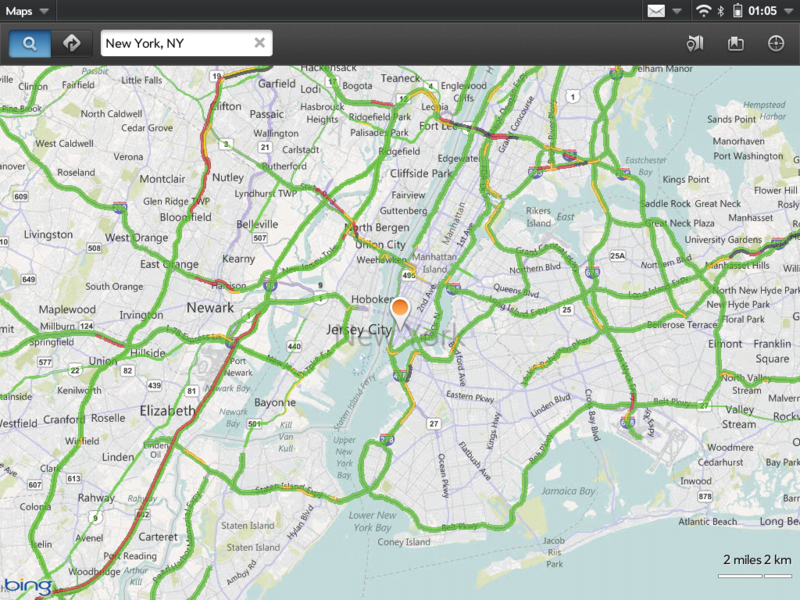 While Enyo forced a ground-up code rewrite of every built-in webOS app, Maps is one of the few that received a complete user interface rethink as well. The new big-screen version of Maps draws data from Bing Maps instead of Google (there’s no option to change your maps provider). There are tradeoffs to be made with the switch to Bing. 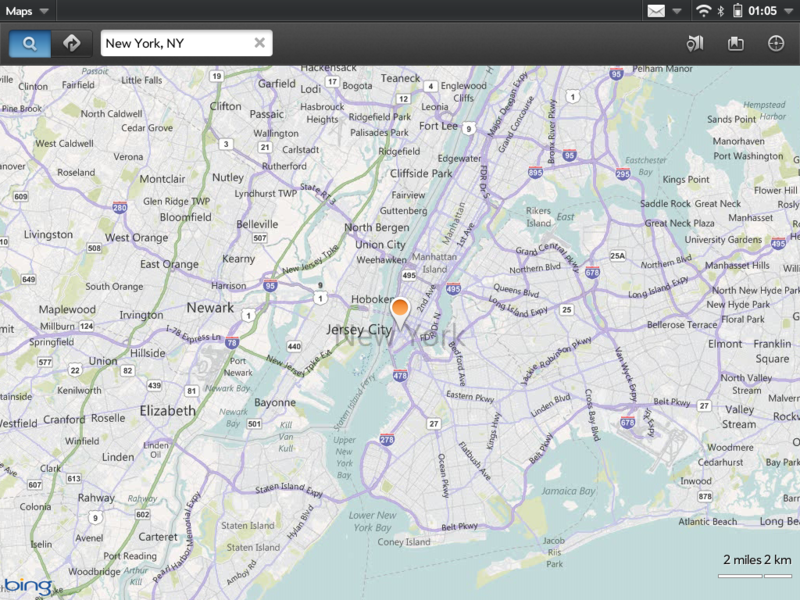 For one, HP has managed to build a much better maps app with Bing than Palm even managed with Google’s strange quasi-cloud app solution. The big-screen interface is much more fluid than the old Google Maps while still supporting all the same gestures to zoom and move about. 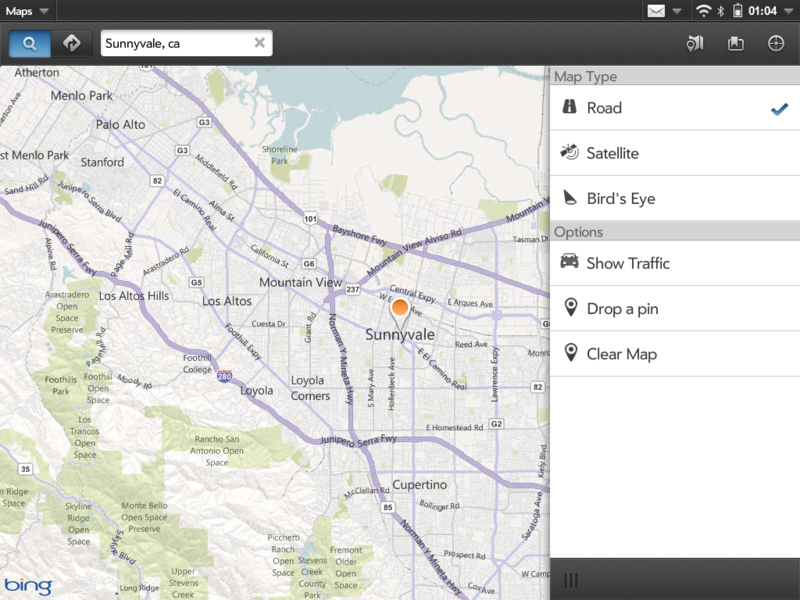 Bing also adds support for “Birds Eye” 45-degree imagery, which allows you to look at any point up close (or far away, if your into such things) from four directions; switching your angle is as simple as rotating the map with two fingers. Bing does support transit directions and traffic viewing, but its support for both is nowhere near as robust as Google’s. 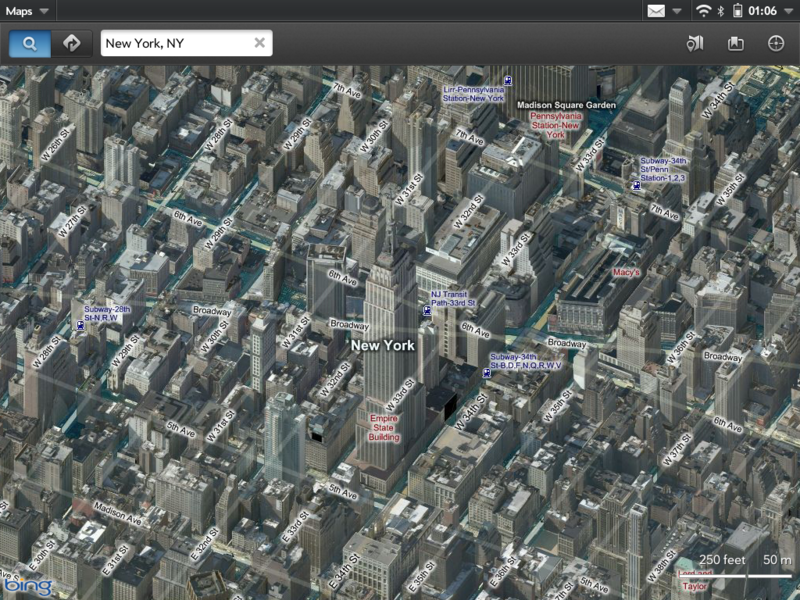 There’s currently no Street View equivalent for Bing Maps, not that we had that as a viable option on webOS either. 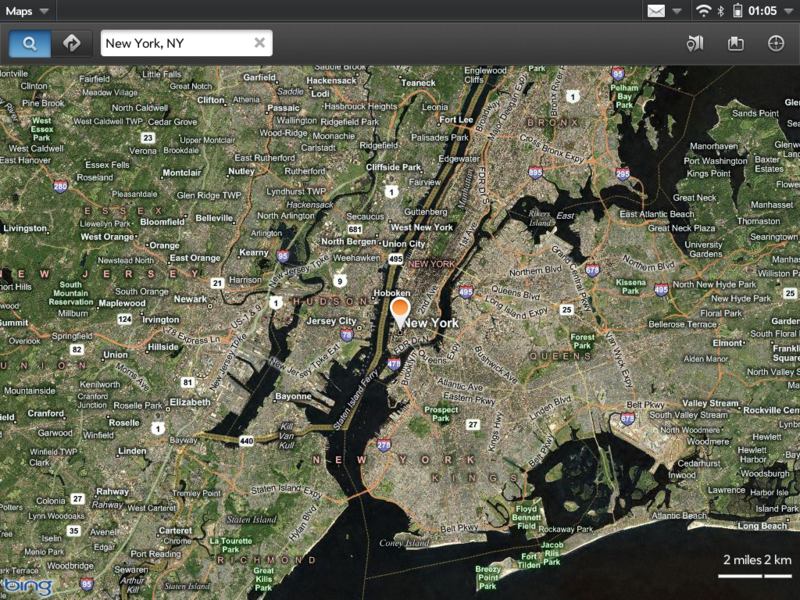 New to Maps in webOS is the ability to drop a “pin” on the map. The pin can then be moved around to any point you desire, and tapping on it will allow you to get an address for that location, as well as get routing to there and save that point as a bookmark. 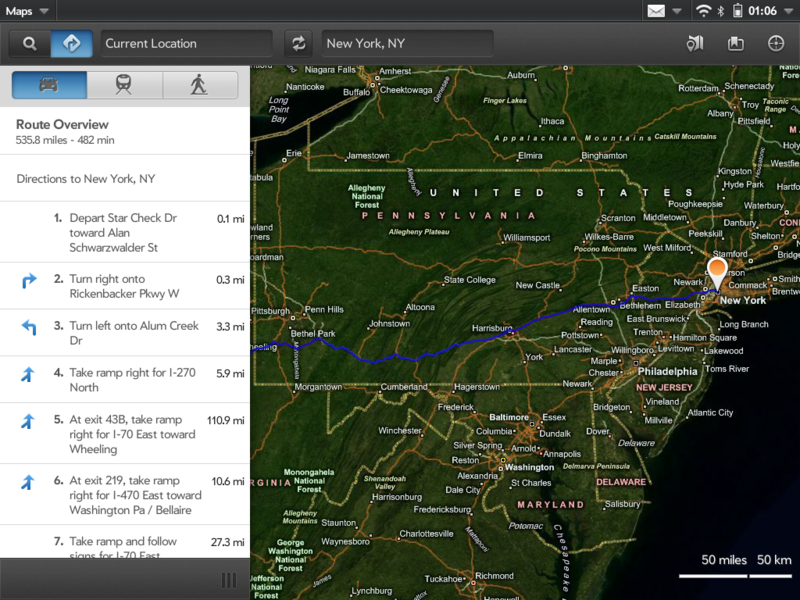 Map views and bookmarks/recent searches are handled via a sliding Enyo panel that comes in over the map from the right. Routing instruction is delivered in two manners: the default is as a bar across the bottom of the map, with buttons to switch between car, mass transit, and walking directions, plus a rout overview and start button that drops to a turn-by-turn mode with arrow buttons to skip back and forth through the route. The second option is triggered by hitting the list button at the left, which takes the bar and slaps it into a panel on the left side, with all the same options as the bar, just in a vertical format with a complete scrollable list of the routing directions. 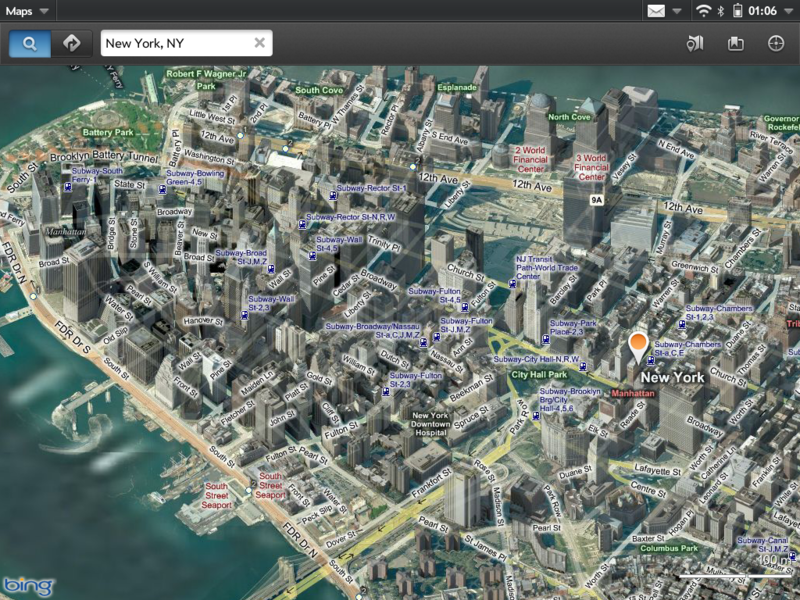 The Wi-Fi TouchPad does not have built-in GPS; it gets its location using Google Location Services. Google Location Services works by calculating your position from the known GPS location of a Wi-Fi network’s IP address, and in our testing it was almost always able to get our location within a block. Needless to say, you’re not going to want to wait for the cellular version of the TouchPad if you’re wanting to use it for actual navigation. If there’s any one app that seems to have the most rough edges, it’s Memos. 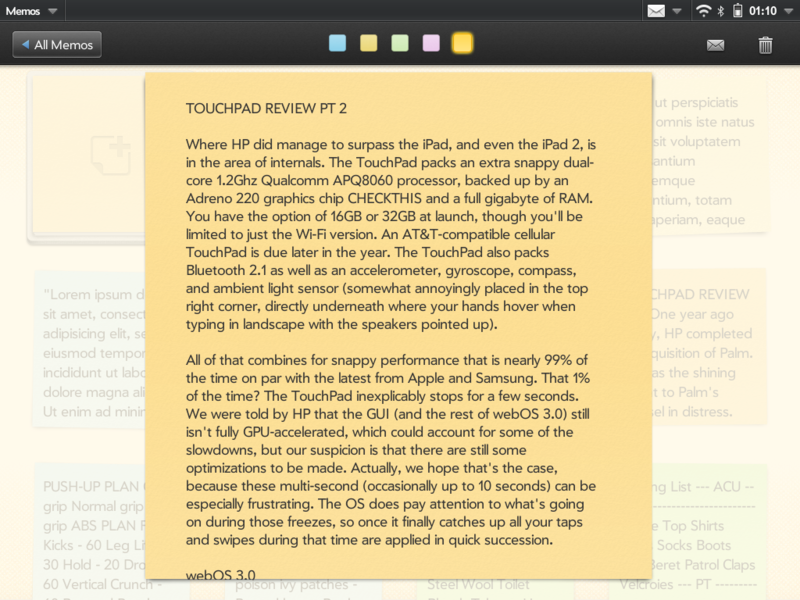 Unfortunately, Memos is the only text editor available at the time of this review for the TouchPad (there’s a Markdown editor in the Catalog, but it lacks basics like autocorrect). And as such, Memos had the inglorious task of being our composition platform for this review. If there’s any app that tested our patience on the TouchPad, it was Memos. 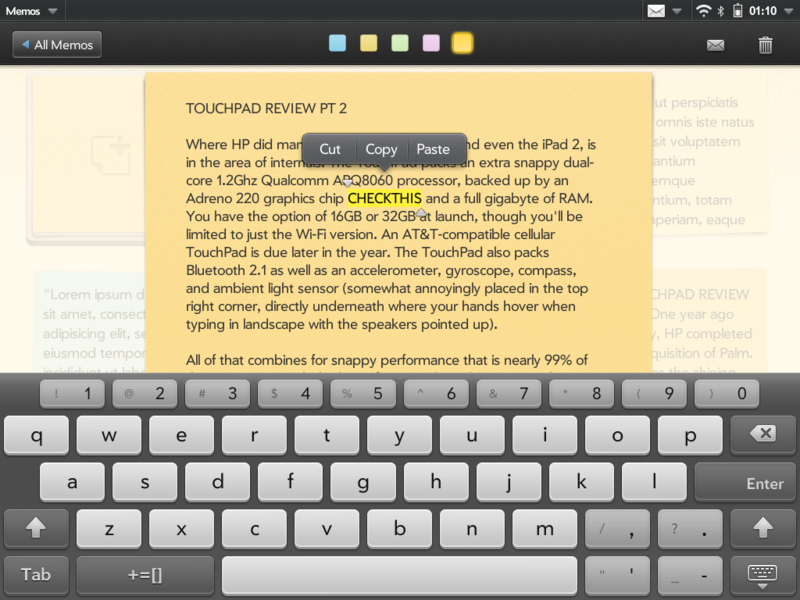 Memos in webOS 3.0 is the grown up big screen version of Memos from the Pre. It uses the same sticky notes grid metaphor, though now placed on a light tan fabric that we can’t help but associate with a cubicle divider (do they not know that sticky notes don’t stick well to cubicle dividers that have been soaked with the tears of their employees?). The top left corner is perpetually occupied the stack of new notes, though it changes to display the color of the next new note. Tapping it opens a square editing window, complete with bowed shadows from your sticky note. You can change the color to one of five at the top (orange being new to the pastel palette). The square editor window ensures that your text does not reflow when switching from landscape to portrait, but it also means you’re wasting horizontal space and always covering part of your note with the keyboard when in landscape. While the user interface is utilitarian with a dose of cute, editing is anything but. First up is cursor placement. As mentioned earlier, cursor placement in webOS 3.0 is an exercise in Zen breathing practices, and Memos only makes it worse. Everywhere else, tapping to place the cursor actually moves the cursor to that position and it blinks like a desktop text editor. In memos, the cursor doesn’t visually move all of the time, and it certainly doesn’t blink. It might be placed in the correct position, but you won’t know until you start typing. Once you get above around 1,500 words in a memo it starts to bog down in a most quicksand-like manner. The app still knows what’s going on and processes what you’re doing, but it can take seconds for text you’ve typed to actually display, and it may or may not have autocorrect applied. Speaking of autocorrect, in every other app when a word is corrected, it’s left with a dashed gray line underneath to indicate that it’s been corrected, and you can tap on that word to see what it used to be and switch it back to that if necessary. That doesn’t always work in Memos – it will autocorrect just fine, but good luck if you want to go back and undo that correction, as your only option is to backspace until you get back there (thankfully you can hold down the shift key to delete entire words with one tap). It seems that the bigger your memo is, the buggier the app gets. You might be thinking that we were being unreasonable in inflicting 1,500-word memos on the TouchPad, and you might be right. If we had a better and more robust document editing solution at our fingertips, we would have used it, but there was no such option available. And problems don’t start cropping up at that threshold –- that’s just where the app becomes unusable and you have to start with a new memo. Problems begin after maybe only a few dozen words. That’s not good. When it does work, the Memos app works well. It hasn’t gained any new features (except for the color orange), but the bigger screen did allow HP to move every option for Memos out of the app menu (which now only holds “Help”.) The top bar across the grid of notes has a search box in the top left, and an Edit button at the right that allows you to delete memos one at a time, but without having to open the memo and hit the trash can icon. You can’t use the Edit button to rearrange your memos, no, that’s not possible. Your memos are ordered from newest to oldest (by creation date), and there’s nothing you can do about it. 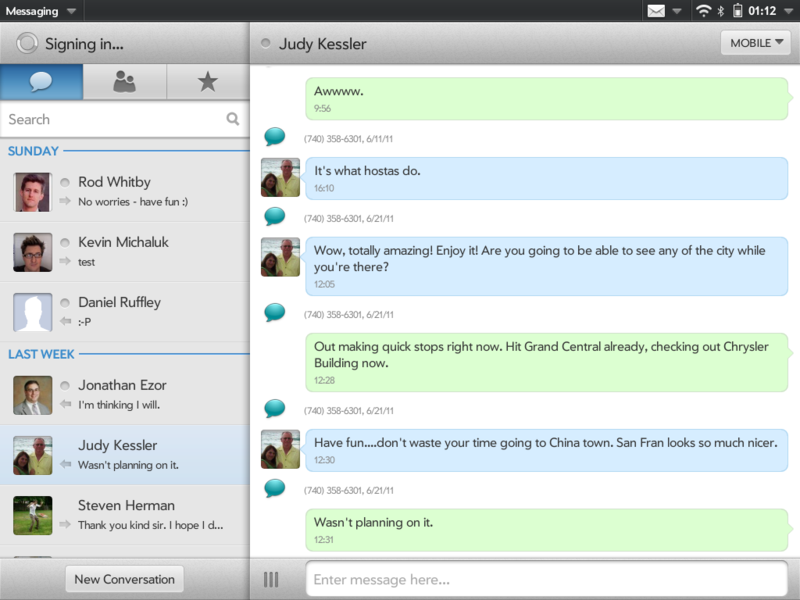 Like Contacts, Messaging’s interface has taken the old webOS interface and scaled it up to the TouchPad’s screen size. There’s a column of your conversations, buddies, and favorites on the left side, with the conversation window displayed on the right. Synergy is in full effect here, allowing you to switch between messaging services through a quick menu in the top right corner. There’s really not anything new here, although unlike contacts you can slide over the conversation panel to fill the entire screen, and the slide it back to view your conversations list (just like in email). We may have lied when we said there’s not anything new in Messaging, because there is. Kind of. The TouchPad can be paired with an HP Pre3 to share text messaging and calls over Bluetooth. As far as the messaging app is concerned, it’s just a text message and treats it as such. Once the phone and tablet are paired, it’s just another chat service. If the Pre3’s set to silent, it’s actually easy to forget that the tablet is working through the phone to do the messaging, at least until you pick up the phone and see the messages you sent and received waiting for you to read them again on the smaller screen. Like Maps, Music received a ground-up user interface rebuild for webOS 3.0. 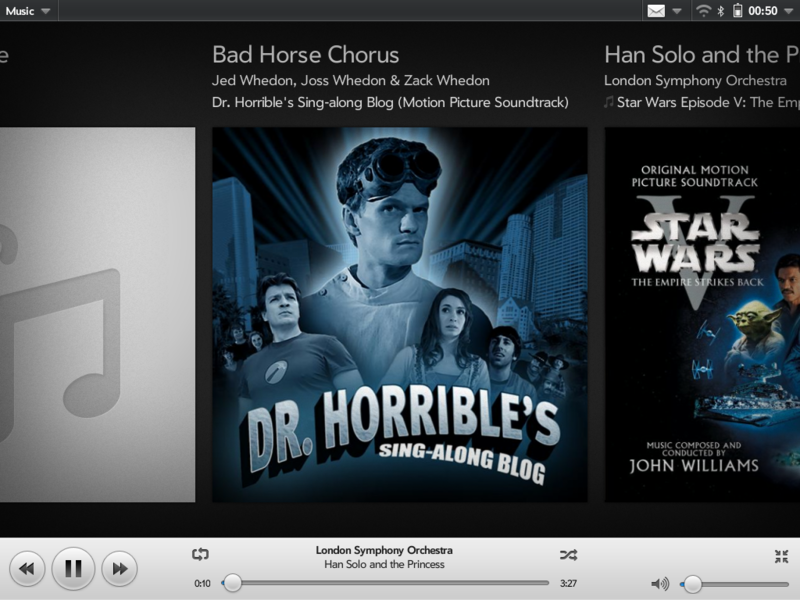 The new app is designed more like a desktop music app than the old fresh-in-2009 but funky-in-2011 webOS music app. All the controls are laid out for the user to see, with a library and playlists column on the left, and the list of songs, artists, albums, or genres (as selected on the left) displayed on the right. When music is playing, a Now Playing drawer slides down at the top of the library/playlists column. If selected from the Artists, Albums, or Genres filters, the song list slides in as a panel from the right, which can be dragged back to the right to go back to the appropriate list of filters. 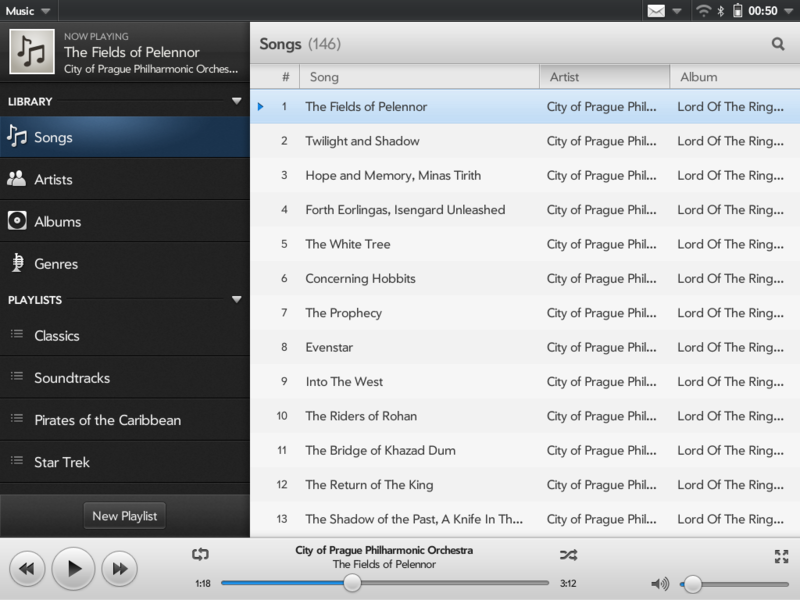 When in the songs view, the vertical list includes columns for Song title, Artist, and Album. Tapping on any one will sort the song list in alphabetical and then reverse alphabetical order. A magnifying glass in the categories views allows you to perform a live search of that category (e.g. searching in Albums searches album titles and album titles only). Along the bottom of the app is a persistent control bar with back, play/pause, and forward buttons, a scrubber progess bar with repeat button, artist name and song title, and random buttons, and a volume slider. That’s interesting is the fullscreen icon at the bottom right corner. It launches into an HP-take on Coverflow, something of a combination of Palm’s Music app, Apple’s iTunes, and HedamiSoft’s Music Player (Remix) 2.0. A flat horizontal scrolling view of all the album covers in your current playlist is displayed. Tapping to the album cover to the left or right will switch to that track, but you can swipe left or right to peruse the album covers, and once you’ve found something you like, tap it to play that track. The control bar stays along the bottom the entire time, with an inverted minimize button to get back to the desktop-style list view (there’s no Coverflow-style way to view the album list in this music app – rotating to portrait merely rotates the whole interface, not its display style). Getting music onto the TouchPad can happen in one of two ways: You can copy music over manually by dragging and dropping from your computer to the TouchPad connected and mounted via USB, or you can use HP’s new HP Play sync software to handle the drag-and-drop for you. 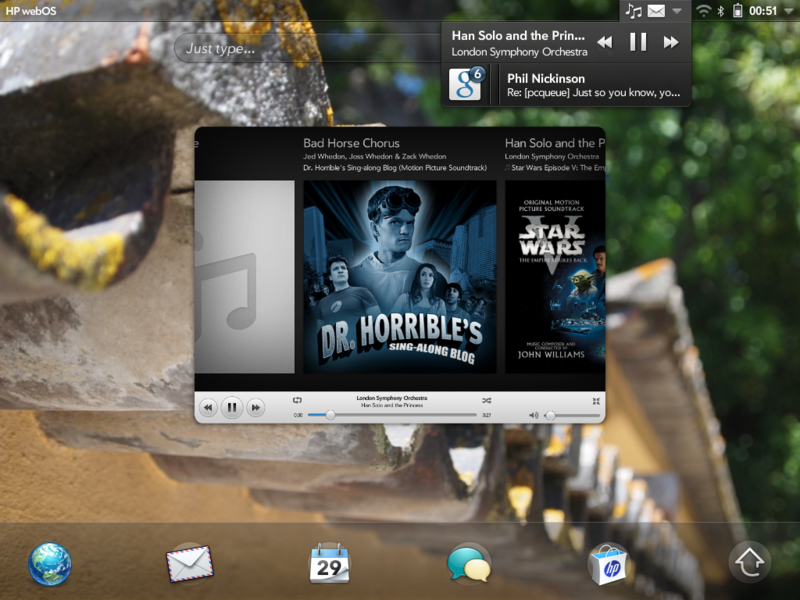 HP Play will be available for Mac or PC and will sync you music from any music library on your computer (iTunes, Windows Media Player, etc). It’s designed to work as a media player if you really want it to, but it’s just not quite there yet. If you want to use HP Play, you’ll want to use it primarily as a sync option, but there are even some limitations there. Your choices for syncing are “everything” or selected playlists. Since everything includes more music that we could fit on our TouchPad, and we didn’t want to leave things to random picking from software we weren’t familiar with, we opted to pick the playlists we wanted transferred. HP Play picked up the traditional playlists from our iTunes, but didn’t grab any of our smart playlists. The app does have the option to create its own smart playlists, but they lack the advanced nesting options of iTunes. So we created a standard playlist to sync over a bunch of stuff we’d like to listen to, hit the sync button, and watched it go. The app successfully transferred close to 7GB worth of music – all DRM-free MP3 or AAC files, ripped from CDs and purchased from iTunes and Amazon over several years. It was neatly organized by artist and album in individual folders, which looked great over USB. So we hit the eject button in the app to unmount the TouchPad. The app said the TouchPad had ejected, and Finder (we’re using a Mac, of course) said it had ejected, but the TouchPad was still sitting there happily with the USB icon on its face. Thankfully, yanking the cable didn’t get us a stern warning like our Pre gives us (or worse, a full-on freeze). Everything seemed good until we fired up the TouchPad’s music app and saw a grand total of 144 songs, when we’d transferred well over 700 tracks. All of the playlists were there, but several were empty. So we plugged the TouchPad back in and looked at the USB drive: the songs were all there. Curious, we opened HP Play again to see if we could get anything to happen. The app was fine until we attempted to see what was on our TouchPad through the app, at which point it froze for five minutes before we had to force quit it. The app did the same thing again, which is a problem since you have to view the music on the TouchPad to sync it via HP Play. Undeterred, we attempted to manually drag-and-drop instead. It worked fine, with the TouchPad mounted as any old USB drive. Once we ejected, it got to work quickly and had reindexed the music database in a few seconds. And found nothing new. Still 144 songs, even though there were 600 other songs on this TouchPad that synced and played just fine on our other webOS devices. We couldn’t figure out any rhyme or reason to why some songs were recognized and others were. There’s something about the formatting, as the TouchPad recognized entire albums and completely ignored others. Like we’ve said a few times before: rough edges. If there’s an app we don’t exactly associated with tablets, it’s “Phone & Video Calls.” But it’s there on the TouchPad, and its implementation is certainly unique. webOS 3.0 has Skype integration built-in from the start, and you can use the app to place audio and video calls over Skype with no issue. 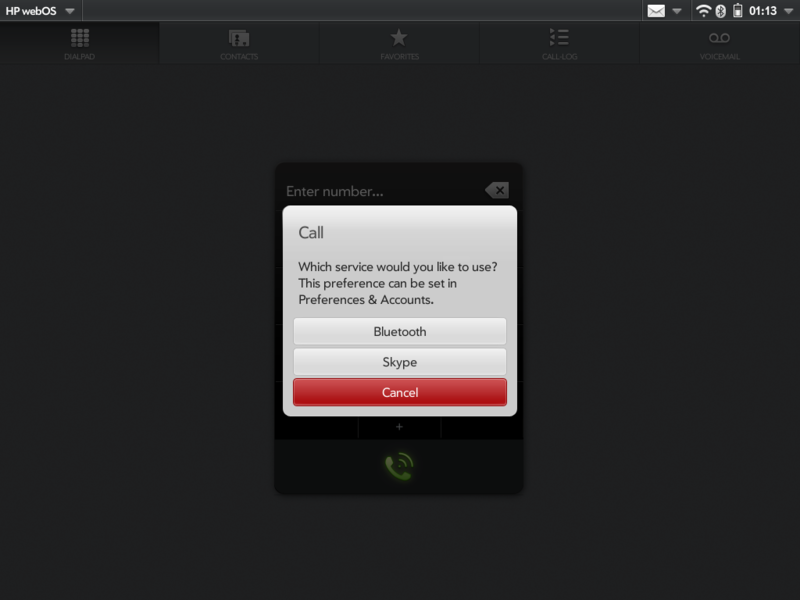 In fact, Skype audio calls behave just as if the tablet were a phone, albeit a phone with only a speakerphone. Not that you’d want to hold a ten-inch tablet up to your head. Callers reported that we came through nice and clear over the audio. 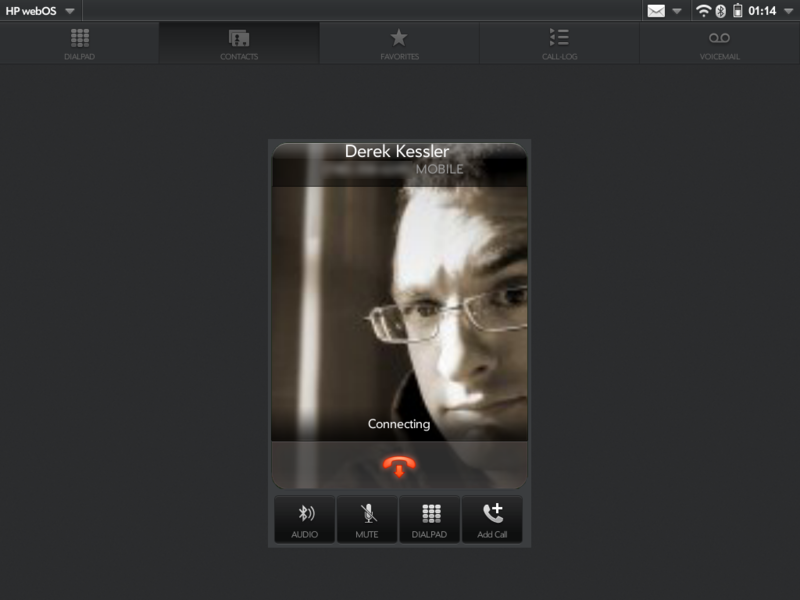 Video calls take place in portrait orientation only (the camera is located at the top of the tablet, after all). The person with whom you’re having a video call takes up the majority of the screen, with your own video getting placed in a thumbnail in the top left corner. Of course, you need to be connected to a Wi-Fi network to place any of these Skype calls, and we ended up doing all of our testing while hooked up to a Verizon LTE MiFi. The end result was that our video came out a little choppy with clear audio, while the video coming in was clean and crisp. Whether that was the fault of the TouchPad or our MiFi was unclear (we were getting a good 2.5-3mbps up, but it’s still over cellular), but even with the stuttering the video calling was still perfectly usable. Where things get slick is when the TouchPad is paired up with an HP Pre3. The tablet can take and place calls through the phone, essentially acting as a giant Bluetooth speakerphone. It’s very slick and something we look forward to using when we can become permanent owners of a Pre3. And before you ask – our Pre3 was a pre-production unit destined for Europe, so reviewing it, or even offering impressions (except to say that we want one even more badly now), is out of the question. Calls from the phone popped up in a phone-style notification at the top right corner, complete with the caller’s photo if available. Tapping the answer button launched the phone app (which takes a good five seconds on the TouchPad) and you were off and talking. The implementation is simple but incredibly functional. 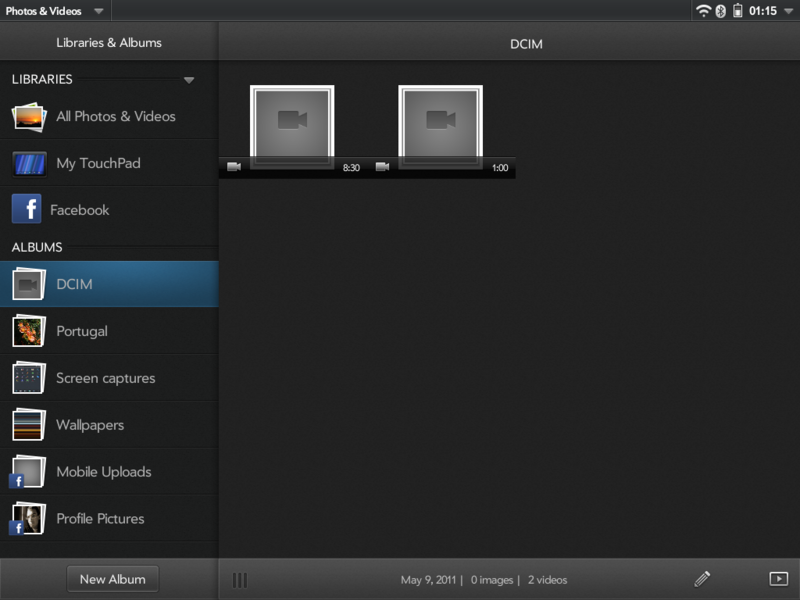 Photo viewing on the TouchPad has gotten the Synergy treatment. 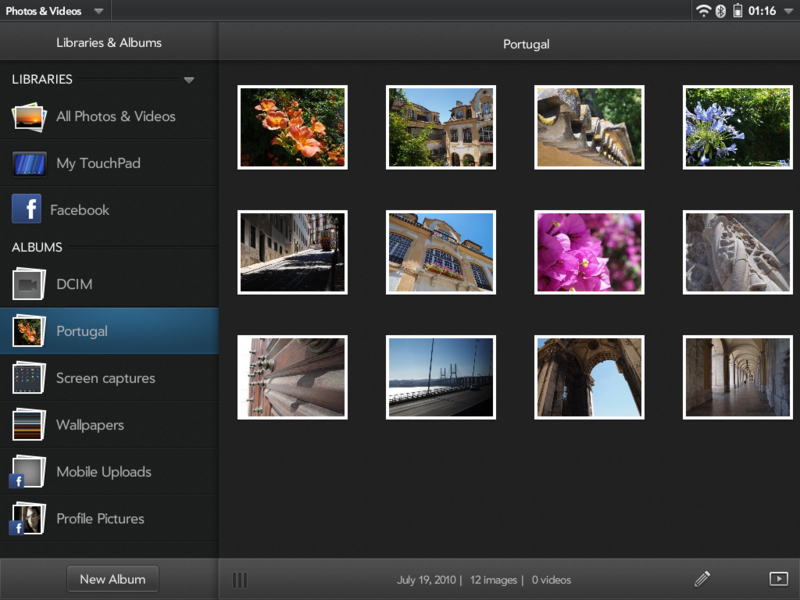 HP’s added conduits for syncing with their own photo service Snapfish, as well as Photobucket. But the photo syncing prize is Facebook, which HP has managed to successfully integrate into Photos & Videos with typical webOS elegance. Your Facebook albums appear as albums in the left side panel of the Photos app, and load in the pictures grid as if they were any old photo. 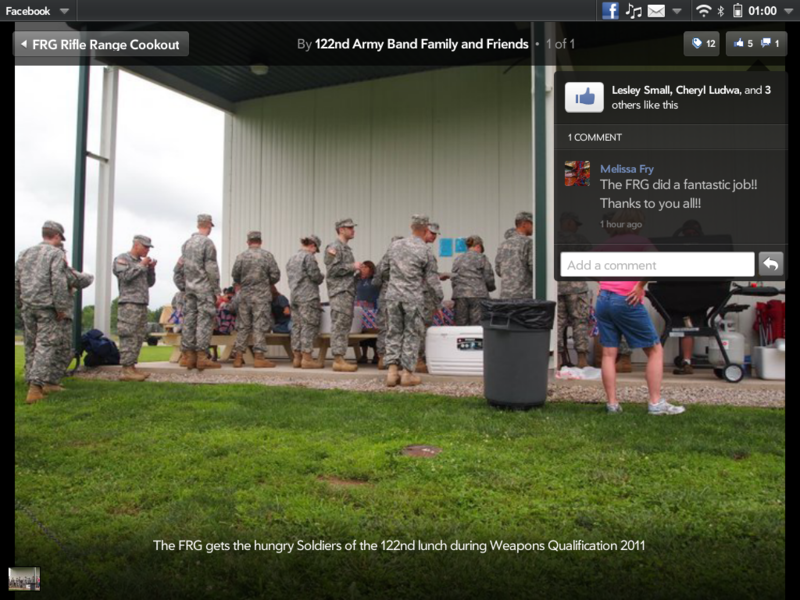 The difference is in the commenting support, which will display comments posted to your photos, as well as allow you to enter your own comments. Of course, you can load up your own photos and save them from the web (there’s currently no way to take pictures using the front-facing camera) and view them just the same. The app is pretty basic: your sources and albums are listed on the left, and the photos are displayed in a four-wide grid on the right. 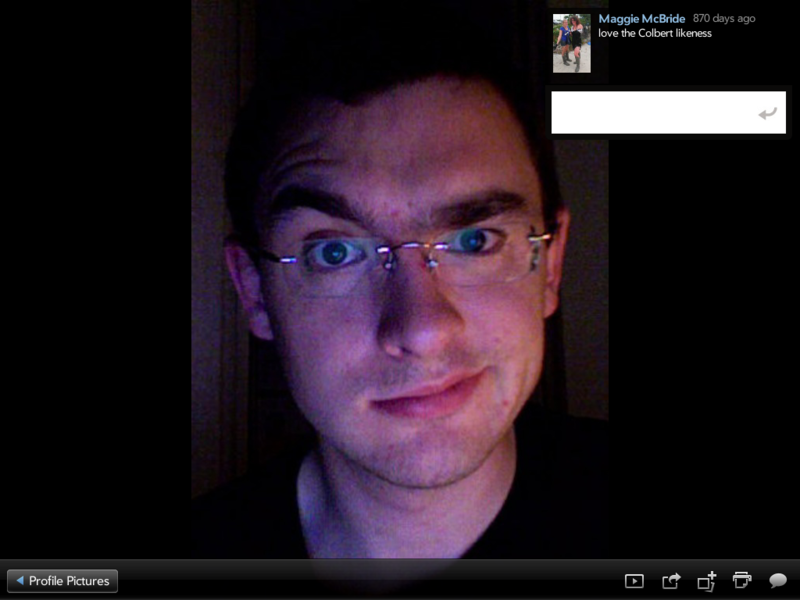 Videos are displayed in a similar fashion, but those that we tested for whatever reason lacked a thumbnail preview. Videos will resume right where you left off if you close and relaunch the app. When viewing both videos and photos, tapping the screen will open a control bar along the bottom. A button to return to the folder view sits in the bottom left, while buttons to activate a slideshow, share via email, add to album, print, and trash (slideshow and print are for photos only, obviously). Photos from Facebook lose the trashcan icon and gain a comment bubble, which when tapped opens a comments box in the top right corner where you can read comments your friends have left you as well as post your own. The last standard built-in app to receive a full rethink is the web browser. The aptly named “Web” emulates a full desktop app, with a persistent top navigation bar containing back and forward buttons, traditional address bar, and buttons to share the current page, open a new browser card, and access the bookmarks/history/downloads panel. It’s a clean and simple interface that works well on this screen size. The browser identifies as a desktop browser and will load the desktop version of most websites. Thankfully, it’s also plenty fast, though it only managed to score a 92 on the Acid3 test. While it might not be the best most standards-compliant browser, it does include Flash 10.3 beta, which worked flawlessly in our testing. 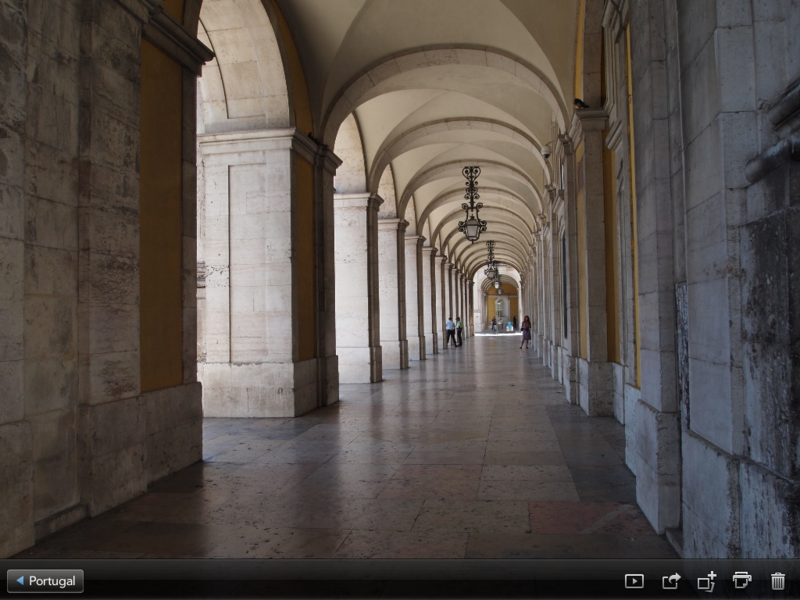 Video from multiple sites, include 1080p YouTube clips, loaded and played smoothly through Flash. There was occasional visible frame rates with 1080p YouTube, but really that’s overkill considering the tablet only has a 720p-capable screen and no video-out option. Hulu does work on the TouchPad, but we imagine it will only be a matter of time before our favorite legit streaming television site blocks the TouchPad browser. Flash is set to autoload out of the box, but that can be disabled in the brower’s preferences. All that said, this implementation of Flash is accessing Flash content as if it were a desktop browser, which presents some problems when you’re wanting to do things like work a YouTube video scrubber. Multiple taps are required to wake the Flash as if you just moused over the video and then reposition the scrubber. All the while you’re likely to start and restart your video at least a few times. Flash does continue to play when you jump up to card view, so if you were hoping to use some Flash-based services in the background (like Google Music Beta, for example), then you’re in luck. Now, about that bookmarks/history/downloads button: it slides in a panel from the right that contains a list of your bookmarks, your recent browsing history, and your downloaded files. Bookmarks and history can be swiped to delete, while the downloads view can only be emptied by hitting the clear button. Selecting any item from any of the three views will load the URL or file and close the panel. Overall the browser is actually quite excellent. There were a few rendering quirks here and there, but by and large it performed like a champ. Complex pages loaded and rendered with relative ease, and pinch-to-zoom and double-tap-to-zoom worked quite well. We’d say the TouchPad browser is right up their with iPad Safari (though it does only manage to score a 92 on the Acid3 test). 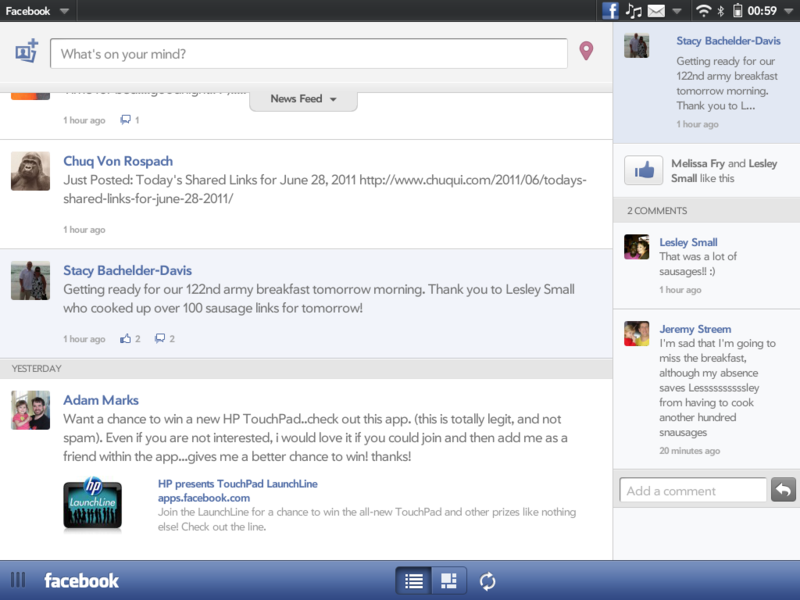 The TouchPad Facebook app is one of the first tablet Facebook apps to land. Developed by HP, the app takes a bounding leap over the only other Facebook tablet app (for the PlayBook) and lands squarely in the realm of awesome. The app is Enyo in nature (naturally), with you navigation between sections (your wall, photos, profile, etc) handled via a left-side list and you content (news feed, post, photos, etc) displayed on the rest of the screen. Leaving a comment on a post slides the main panel to the left, revealing the comments in a column on the right. It’s simple and intuitive. Aside from the standard list view for your Facebook news feed, there’s also a slick grid layout that arranges photos, links, and posts in varying-sized boxes that make for quick scanning of what’s going on in your feed. It’s a unique layout and one we can see ourselves turning to on a regular basis for our more casual Facebook reading. Regardless of view, photos open into a dark browser with the photo you’re viewing filling the center and a line of mini thumbnails along the bottom where you can jump to other photos (or swipe left and right on the main photo). There’s a comments and likes button in the top right corner that opens a panel quite similar to that of the Photos & Videos app. 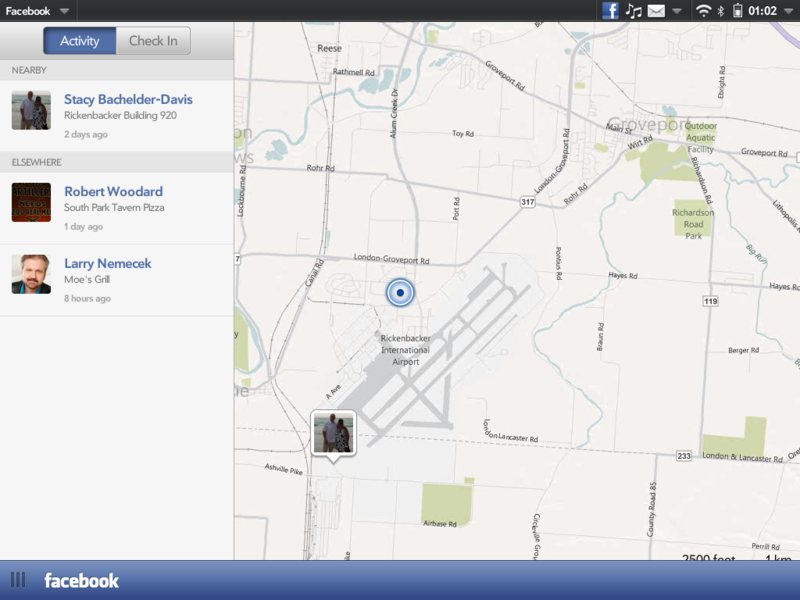 The Facebook app is also unique in its integration with Maps and the browser. Tapping a link will load that page right in the Facebook app instead of opening a new browser card. 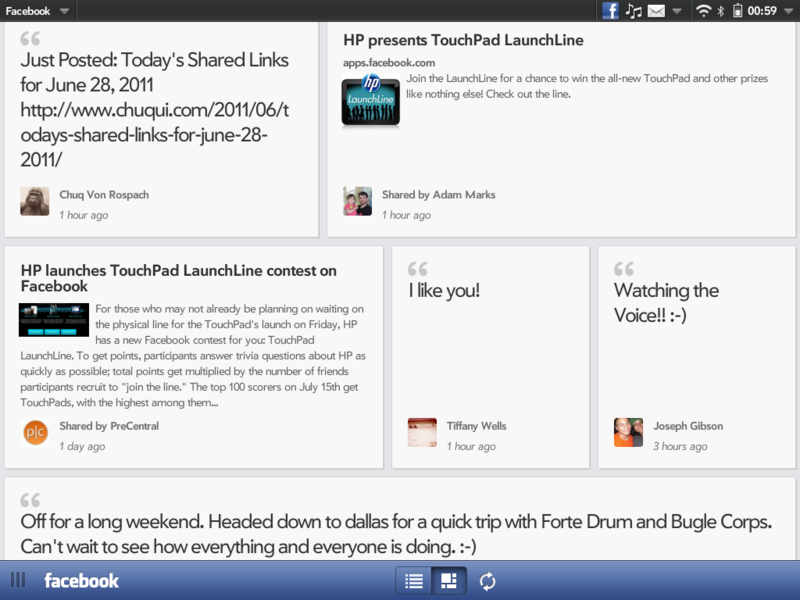 This allows you to check out whatever it is your friends have linked to, but still have the context of their comments. A swipe or tap on the drag handle throws the webpage off to the right. 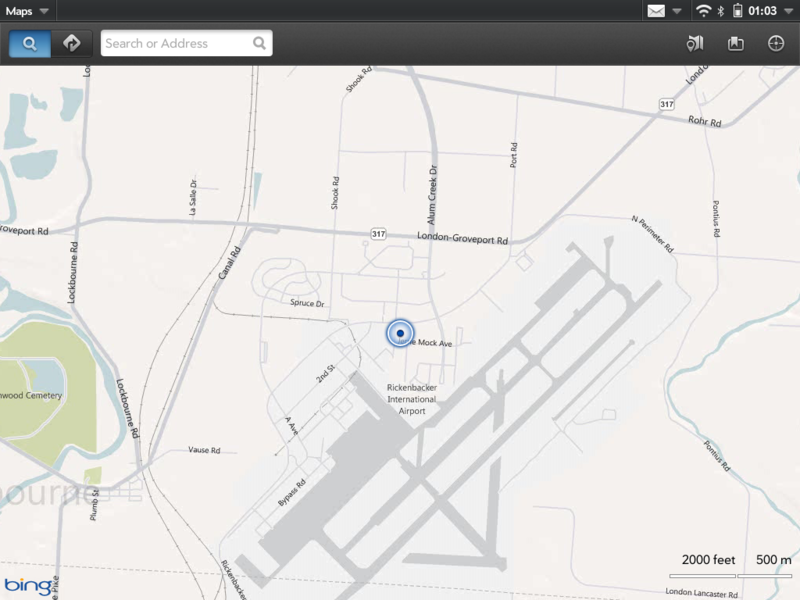 Places opens a similar view, with your location and available check-in locations displayed from the Bing-powered Maps app, all within the Facebook app. HP says these integration APIs are available to developers, and we’re looking forward to seeing more apps with them. As was announced at the February 9, 2011, reveal of the TouchPad, HP partnered up with Amazon to build a Kindle app for the TouchPad. 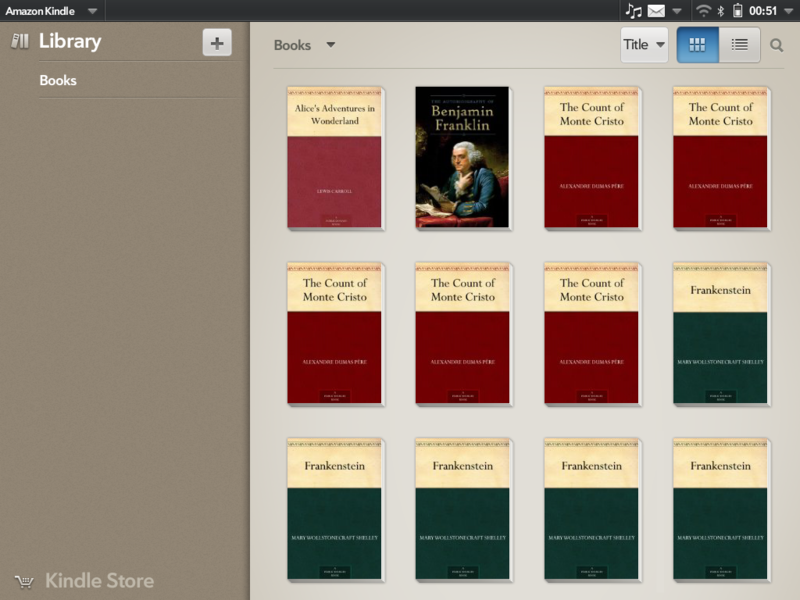 The app is quite similar to other tablet Kindle apps, with a two-page layout in landscape and single page in portrait. Tapping the sides of the screen will move to the next or previous page, as will swiping across. 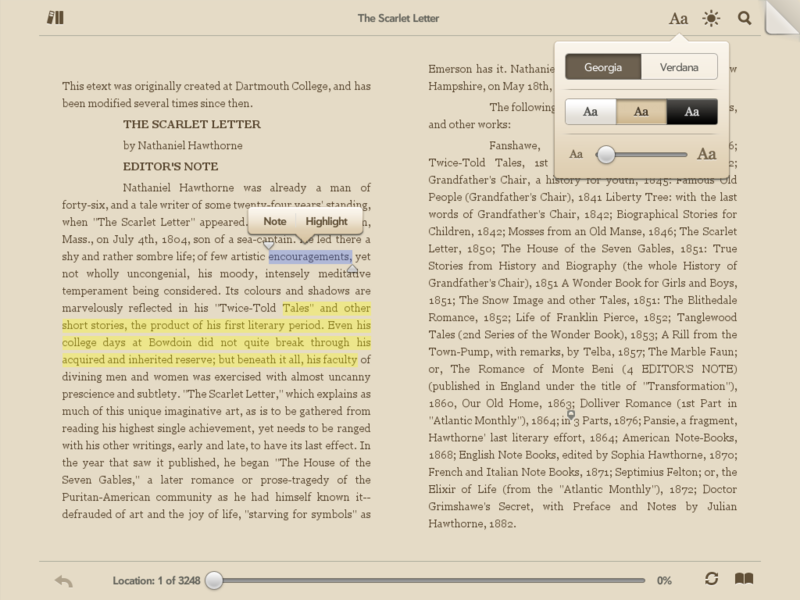 Tapping the center brings up navigation controls that include a scrubber at the bottom and back button, Kindle WhisperSync button, and quick-jump button for navigating the content. There’s also an options bar across the top with buttons to take you back to your library, adjust the font, size, and color, change the screen brightness, start a search, and dog ear that page. 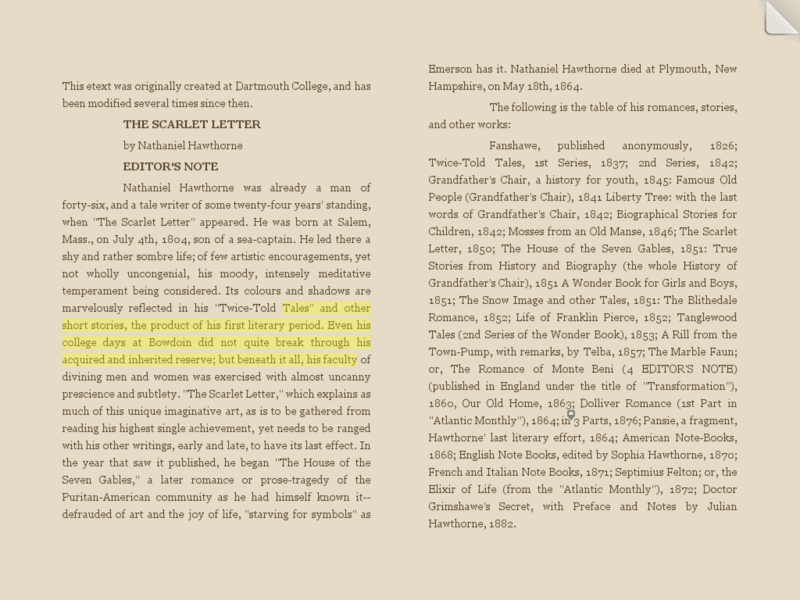 Highlighting and notes are fully present in the TouchPad Kindle app: tap and hold on any text and you’ll get copy-paste style controls asking whether you want to mark a note or just highlight the text. Those notes, highlights, and your dog-eared pages are all found under the Markups tab when you select Notes and Marks in the quick navigation button. Shopping for books using the Kindle app is less enjoyable. There’s a link to the Kindle Store at the bottom of the app, but it launches into the browser into the desktop version of the Kindle Store. Yeah, buying books through the browser isn’t exactly difficult, but it’s still a less-than-integrated experience that won’t necessarily go over well for those expecting a seamless experience. HP has told us that there’s an update for the Kindle app (which apparently is currently a beta version) due shortly after launch, hopefully that will integrate the store with the app instead of launching the browser to buy yourself some books. HP’s made a big deal for some time about their corporate goals for the TouchPad, and full-featured Microsoft Office suite support is practically a requirement for any enterprise tablet. Sadly, full-featured the Office support on the TouchPad is not. The QuickOffice suite works well enough for viewing and is nicely integrated with the cloud (pulling in documents from Google Docs, Box.net, DropBox, and on the devices), but it’s lacking a major feature for any documents suite: editing. That’s right: the tablet meant to conquer the boardroom has zero document editing support out of the box. The QuickOffice Suite supports the viewing of Excel, Word, and PDF files (which launch into a separate Adobe Reader app). It does not yet support PowerPoint files, nor does it any editing. HP told us that an update is in the works to add document editing to the TouchPad’s QuickOffice suite, but until that update is pushed, all we have is a fancy document viewer that pulls in content from the web. That fancy document viewer is at least marginally functional – it was able to handle all the Excel and Word documents we threw at it, as well as a gaggle of PDFs. Nowhere to be found on the TouchPad is a Tasks or YouTube app. HP indicated that they believe the TouchPad’s Flash implementation is good enough for YouTube use, and we’d actually agree, so long as you don’t have to use the video scrubber. The omission of a to-do app, a staple on webOS devices for over two years and on Palm OS devices all the way back to the beginning of time, that’s particularly egregious. Also missing is anything not called Skype that’s able to take advantage of the front-facing camera, a calculator (seriously, HP, a business tablet with no calculator? ), clock app, any way to purchase music and movies, and voice control. HP says that a HP MovieStore and third-party music purchasing service will be available at launch, but they didn’t seem to be ready in time for our review. Additionally, Word document and Excel spreadsheet editing is due by mid-summer. Read part two of our comprehensive HP TouchPad review.